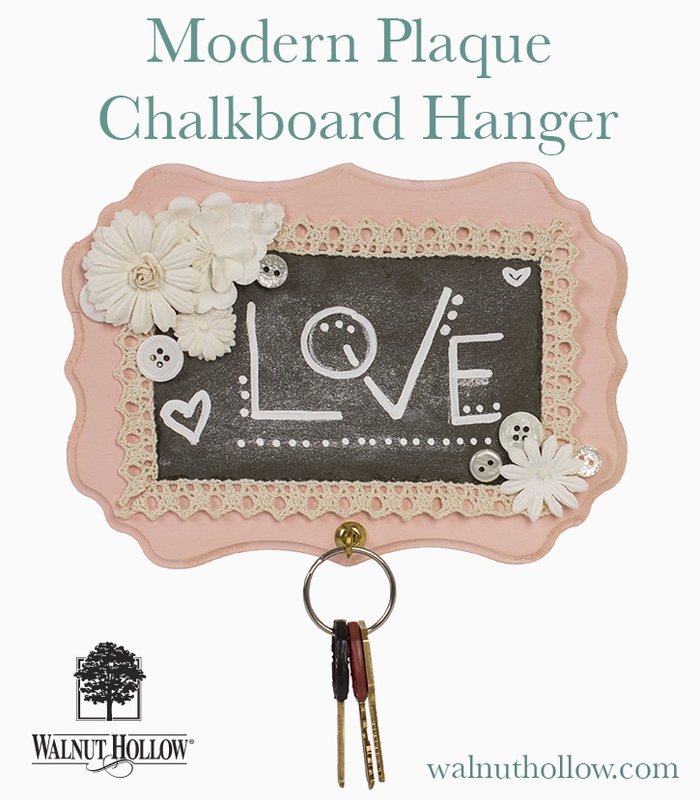 I designed this Modern Plaque Chalkboard project for Walnut Hollow’s Make-and-Take at CHA back in January. It was a big hit! I will share pictures from our booth at the end of the post. This project was really easy to make. I started by sanding the Thin Modern Plaque and spray painting it with Krylon Spray Paint. 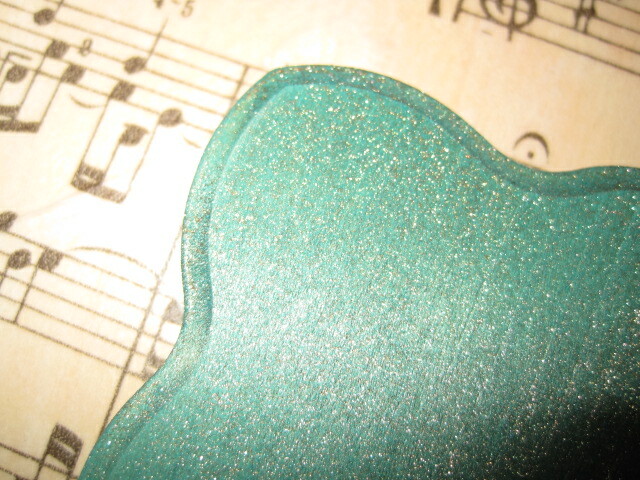 I used Ballet Slipper on half of the plaques and Catalina Mist on the other half. I conditioned chalkboard paper with the regular chalk and wiped off the excess with a paper towel. 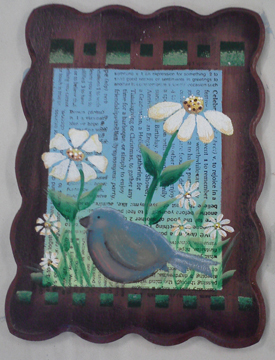 Then I cut the paper to fit onto the modern plaque (about 3″ x 5″) in the center of the plaque. 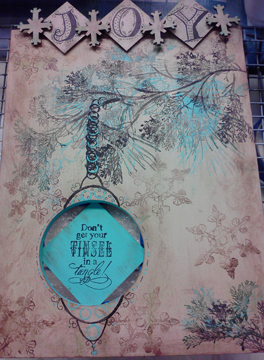 I glued it down using a Tombow Stamp Runner. 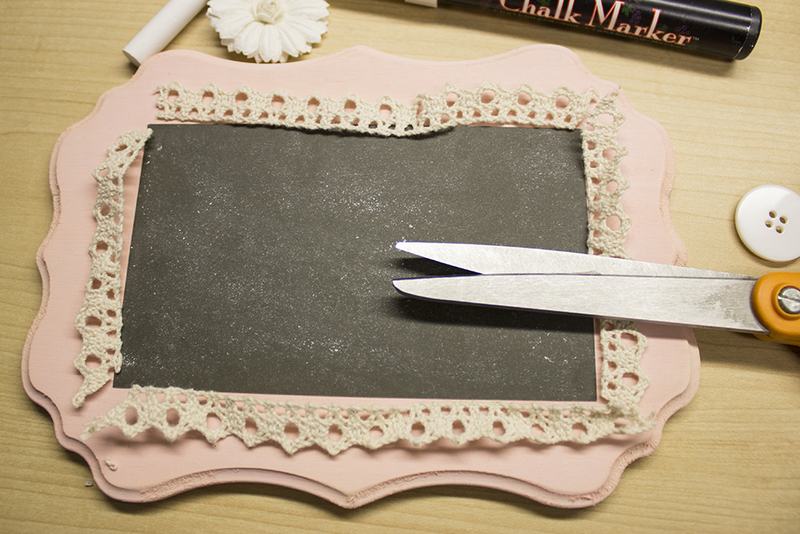 I added the trim around the chalkboard- cutting it down using the edges of the chalkboard as a guide for the length needed. 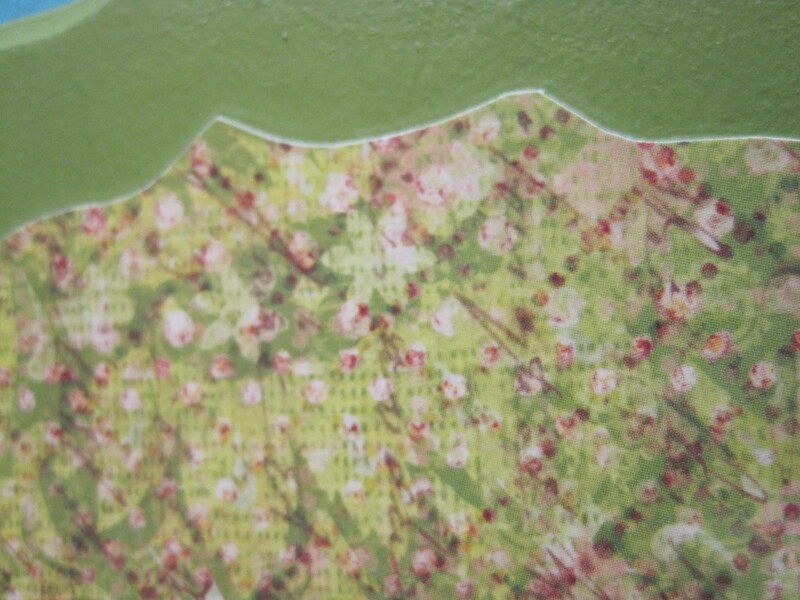 I glued down the trim using Beacon Gem-Tac Adhesive. It will dry clear! 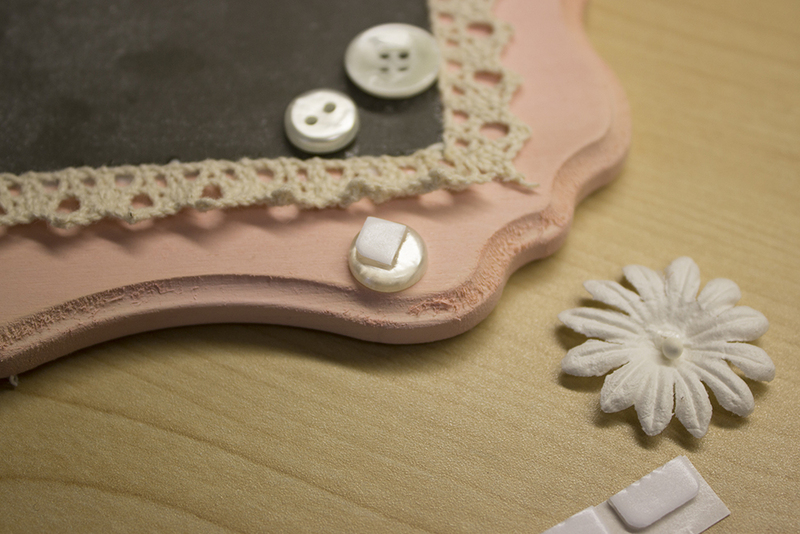 Once the Chalkboard Paper and Trim were in Place I was ready to add the floral and button embellishments! 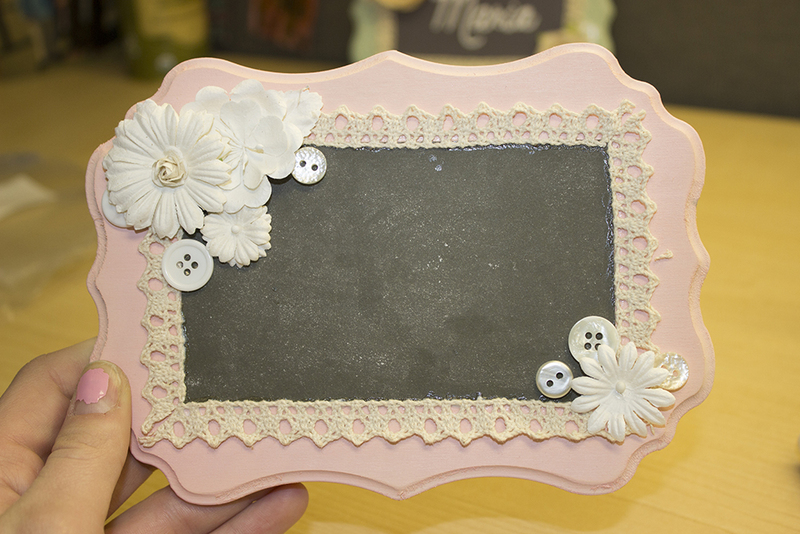 I used Tombow Power Adhesive Tabs to attach the Prima flowers and the Buttons Galore and More buttons to opposite corners of the chalkboard. 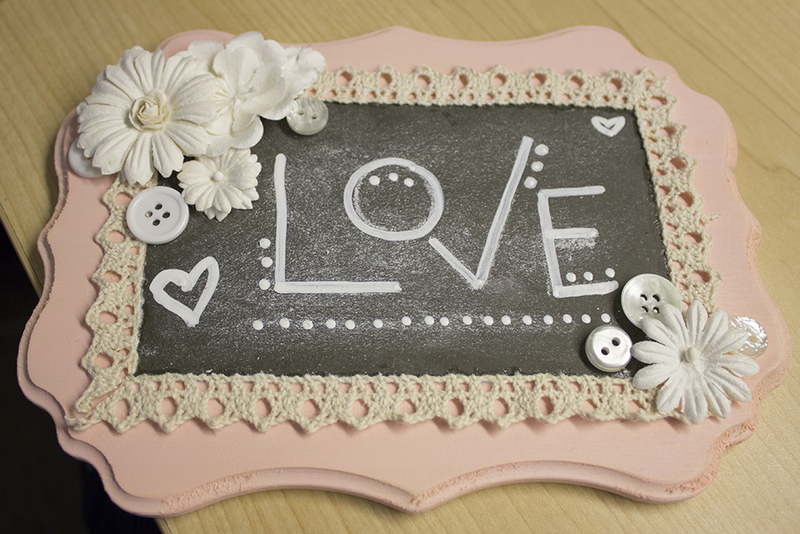 To write my message on the chalkboard, I first drew it out with some white chalk. It comes off easier than the Chalk ink because it does not need water. 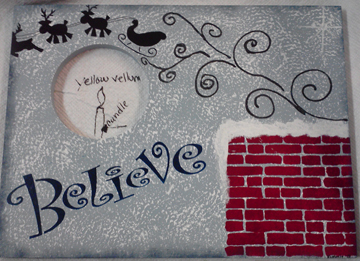 Then I traced over the design with the chalk ink pen. Finally I added a screw hook. 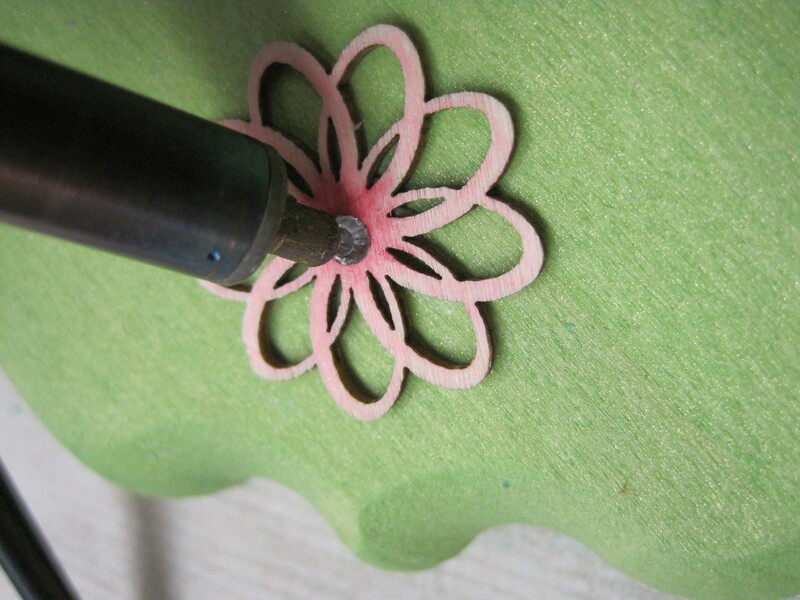 The basswood is soft- you can just push the screw into the wood then turn. It will go in easily. 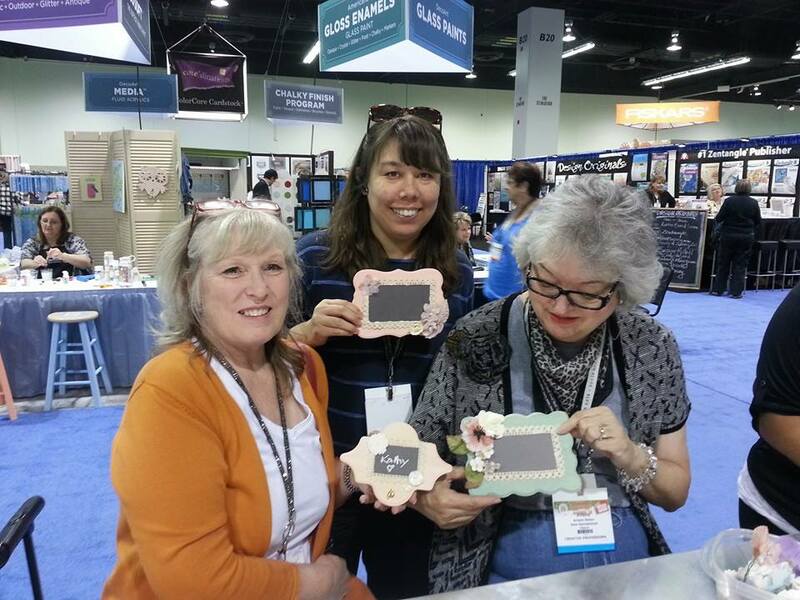 Here are some finished pieces from our CHA booth! 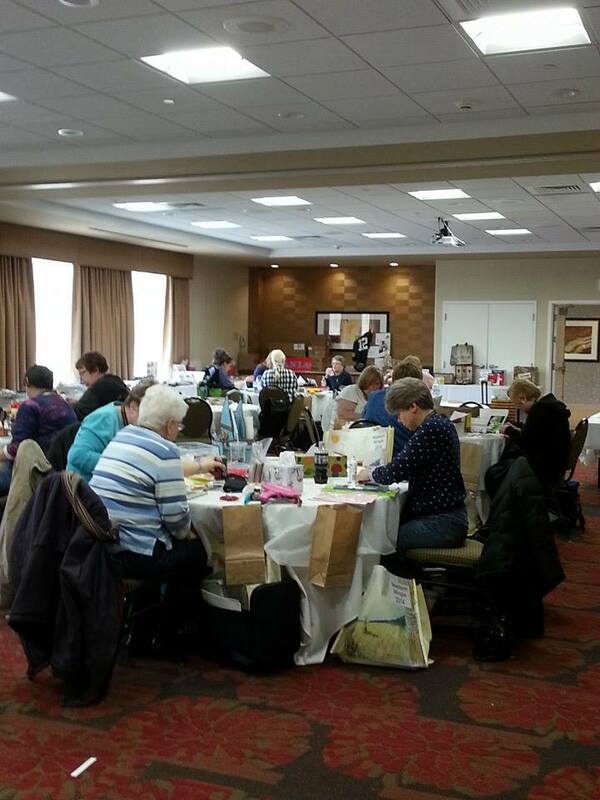 Last week we went to Madison Mingle in Madison, Wisconsin to show the participants how to make the same project! 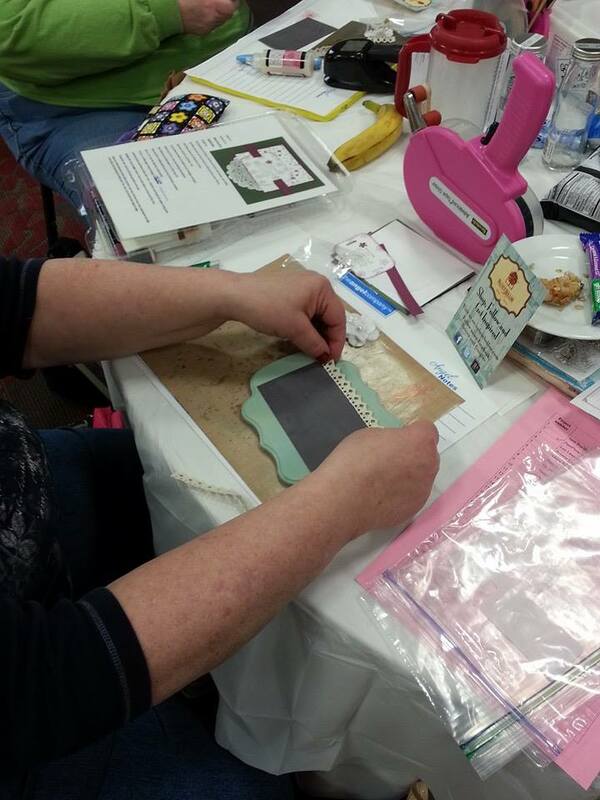 It was really fun to work with card makers- and we got to make some cards too! 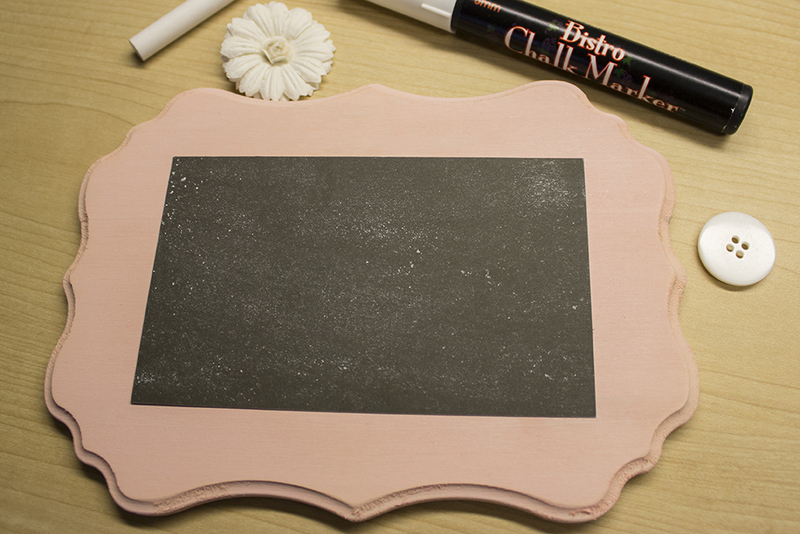 Now go forth and make your chalkboard! 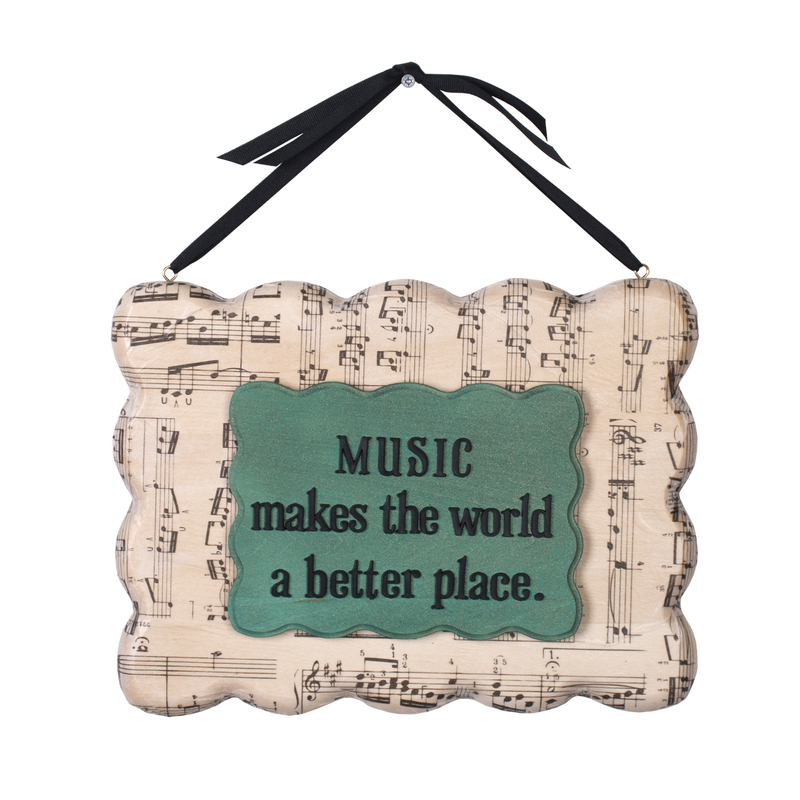 Like many of you, I have always loved music. 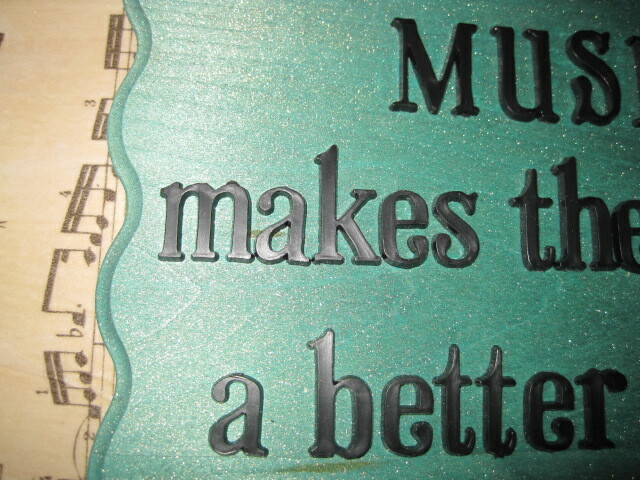 I like all kinds of music, with a couple of exceptions – not too fond of rap or heavy metal, but enjoy the rest of it. 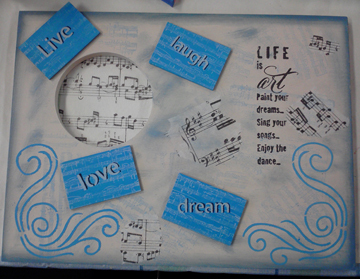 When I saw the Tim Holtz® tissue paper rolls, one featuring sheet music, I knew I had to have it – along with his plastic sticker letters. Then everything just sort of all fell into place for the project I created. 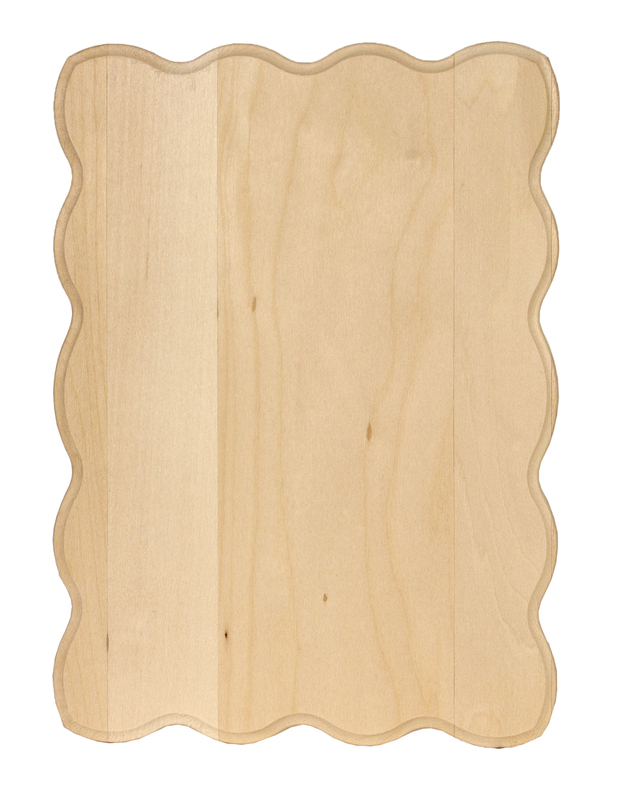 We had originally created the larger Modern Plaques, then added the Thin Modern Plaques to the mix. They are great to use alone or together. 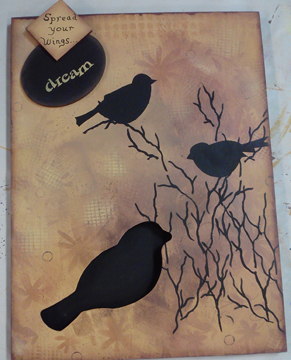 To decoupage the Savannah Modern Plaque, I used a large flat brush to apply a heavy application of Mod Podge to the Plaque. 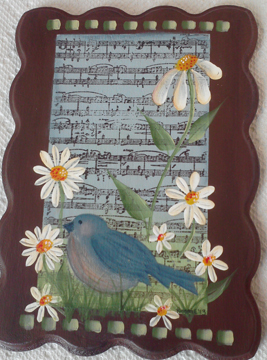 Tear off a piece of Music Tissue Paper to fit the Plaque (the tissue paper tears off like Saran Wrap or foil) and lay it onto the wet Mod Podge over the Plaque. Use scissors to quickly snip the tissue paper near each indentation of the scallop edge and smooth the paper with your fingers. 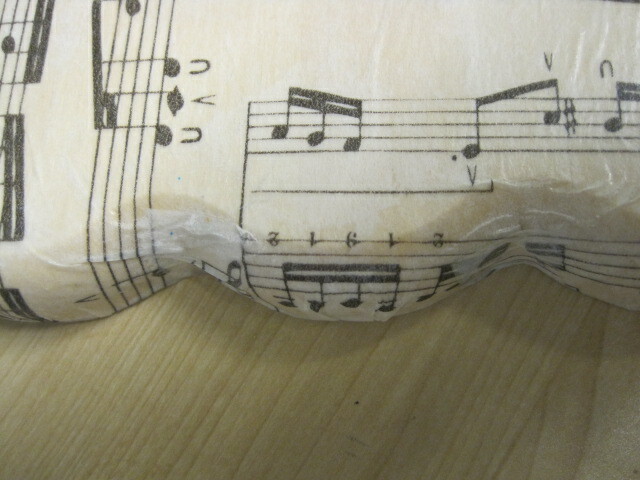 I needed more paper to fill in the scalloped edges, so I cut smaller pieces of tissue to add where it was needed. 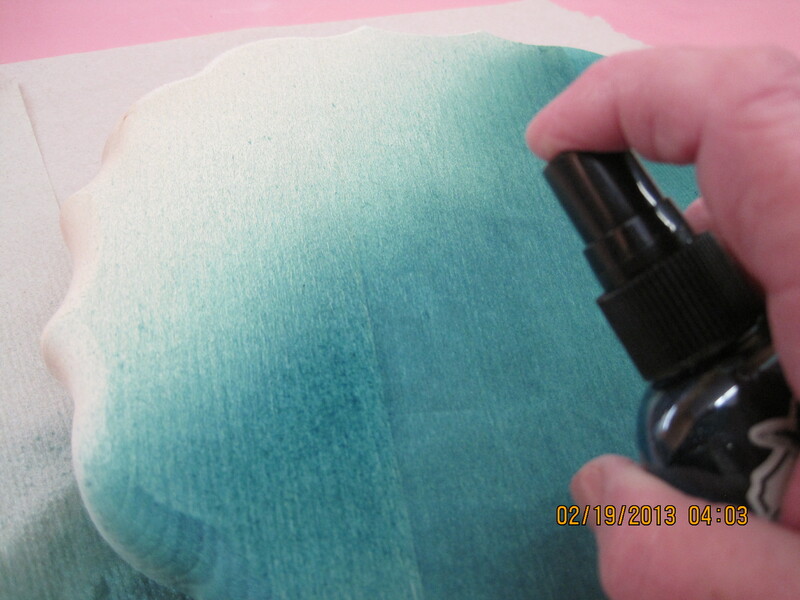 Add another coat of Mod Podge over the top of the tissue paper and smooth everything with your fingers. This is messy, but really does the trick. Let the Plaque dry thoroughly. 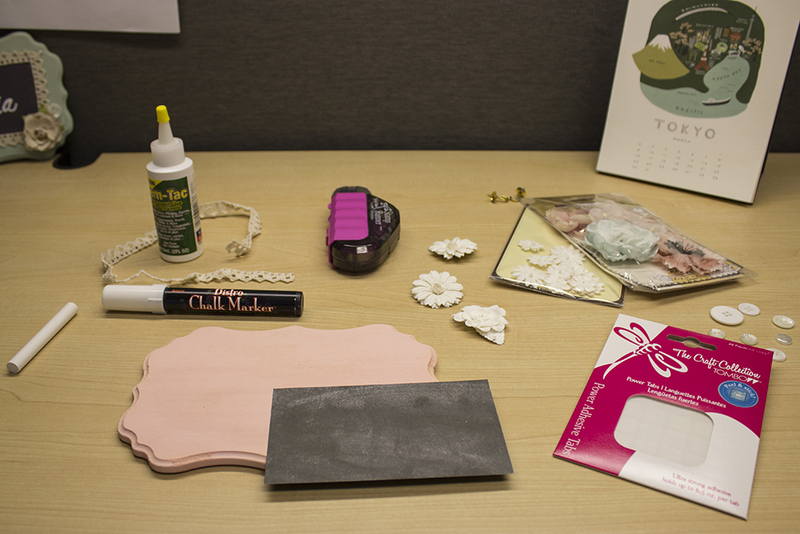 Cover your work surface with paper and mist the Savannah Thin Plaque with Verdigris Glimmer Mist. Let dry. Once the Savannah Thin Plaque is dry, add the black plastic sticker letters. A trick I learned years ago – pencil the saying out on paper as you want it on your Plaque. Count the letters (including spaces) in each line. Divide the number by two – then count from the left to find the center letter or space of that line. Work away from center to the left and right. An example would be the line that reads “makes the world”. There are 15 letters and spaces. The center of the line would be the letter “h”. I place a ruler at the bottom of where I want the line and pressed the letter “h” in the center which is shown on my ruler. Then I pressed the “t”, then the “e” – and so on. So the spacing was good for each word and the line was as straight as I could get it. 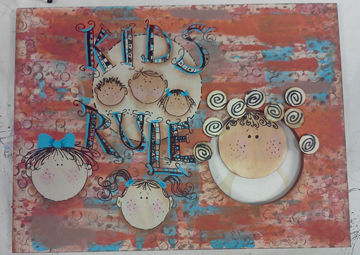 I added screw eyes on each side at the top of the larger Plaque then glued the Thin Plaque in place with MONO Multi Liquid Glue by Tombow®. I put black satin ribbon through the screw eyes and it was ready to hang once the glue on the Plaque was dry. 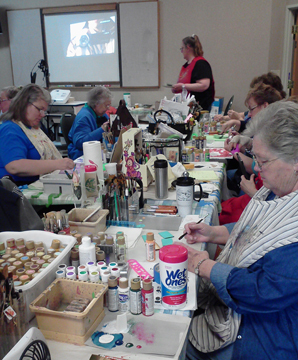 For several years, Walnut Hollow has provided a variety of products for Laurie Speltz to use at her gatherings held twice a year near Des Moines, Iowa. This year, Laurie shared photos with us so we could share them with you. 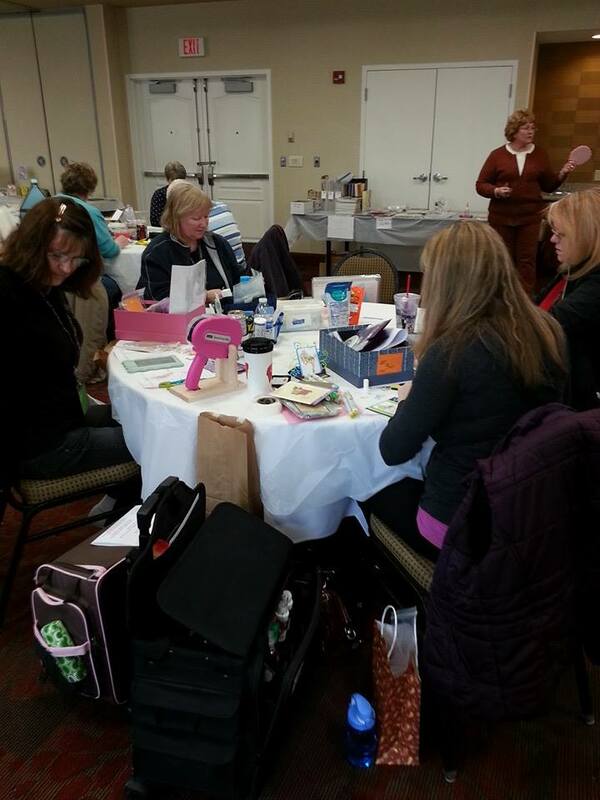 Laurie calls her gatherings “Creative Coach University”. Creative Coach University (CCU) is the brain child of Laurie who is “The Creative Coach”. 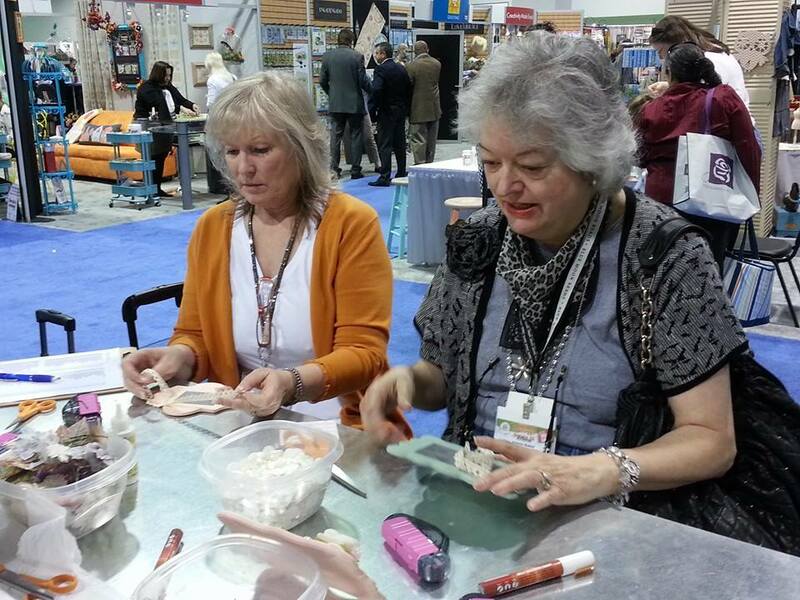 It was created to share new product, ideas and techniques with participants who normally didn’t get the opportunity to attend trade shows and conventions. The goal was to allow these students to not only learn about new products but also get the chance to take them out for a test drive and see what can be done with them. Attendees are pushed outside of their box and comfort zones. They learn not only from their own work but from the work of all the other participants. They are allowed the chance to brainstorm and play with products and techniques. Play is the one thing that most people don’t take the time to do. 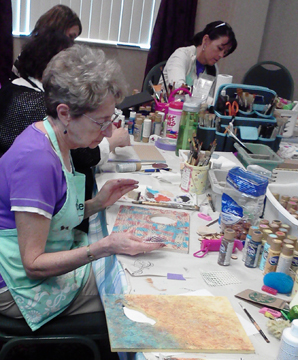 Laurie doesn’t put an emphasis on finishing the piece during a session, she concentrates more on gathering valuable lessons and alternatives to projects. Sharing is what everyone looks forward to. They are invited to use their cameras and gather as many ideas off of other participant’s projects as they would like. They learn to gather ideas for the future and to repeat the projects when they get home in the comfort of their own studios. Where most seminars have a sample project and everyone tries to match it, participants at CCU try to and are encouraged to come up with something unique and new to share. They do have the option of following the example if they aren’t ready to step out of their boxes. 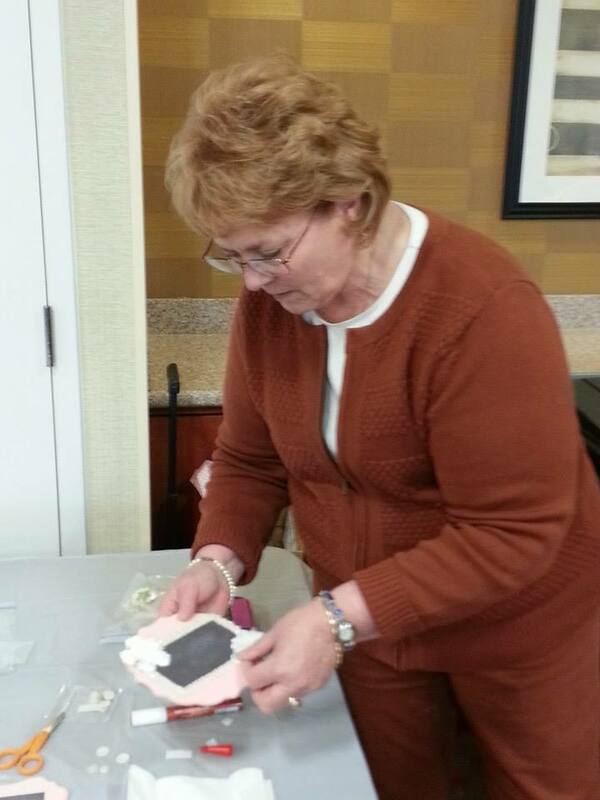 People enjoy the freedom to “play” with products and adapt the project to meet their needs. 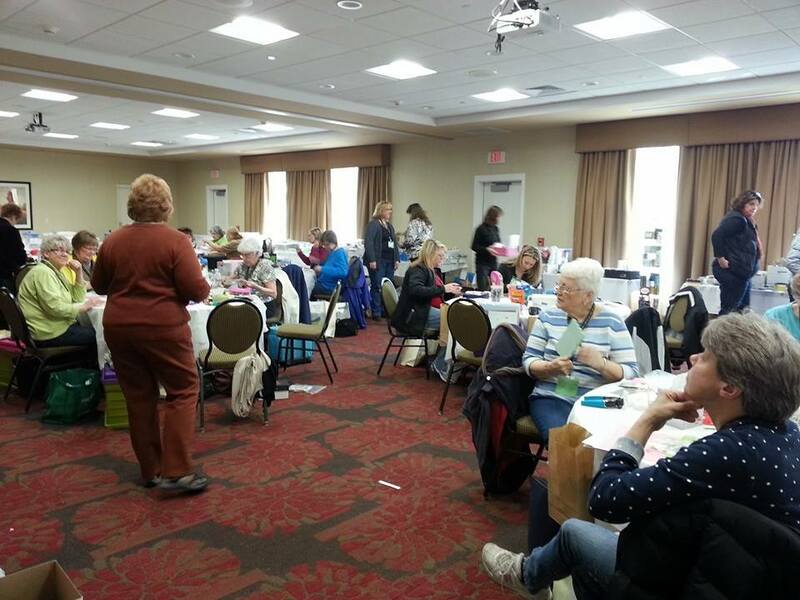 They have professional crafters, designers, teachers, shop owners and general crafters/painters participating in each session. They also cover topics such as: how to get published, trends, color, how to hunt for the ideas, how to spark creativity, legal issues related to the industry, ethics, business practices, how to buy wholesale, how to attend trade shows, how to find new products and more. The topics explored are geared towards the participant’s needs and questions. 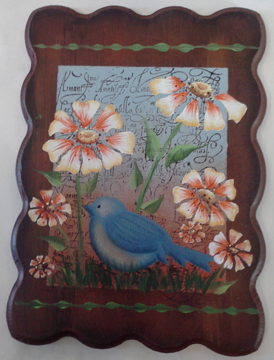 Savannah Thin Plaque: Laurie said, “The Savannah Thin Plaque was a lesson in recreating the look of tin on a board with a layered design using stencils and stamps on top of it. The sample they were working from was done on a tin pocket. 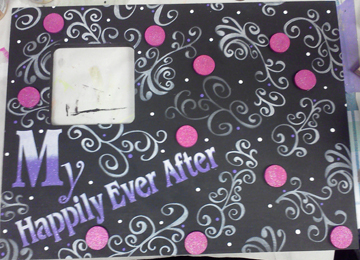 They learned a lot about blending and layering of color to create the illusion of tin in their backgrounds. 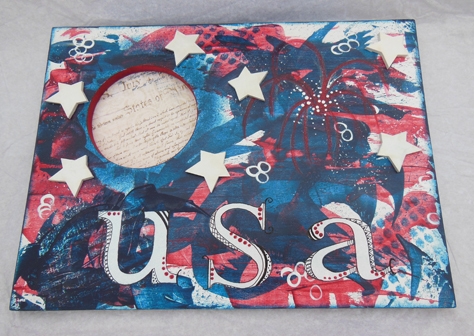 The rest of the project was achieved with stamps and stencils.” Stampendous, a rubber stamp company and more, provided lots of stamp options to work with. 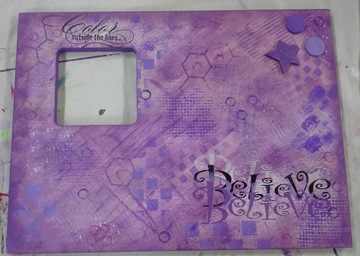 The participants used Laurie’s line of Basecoat Stencils to add fun borders and elements. 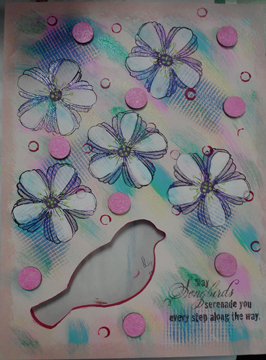 You can see variations in stamps used, theme, borders and colors in some of the samples shown here. 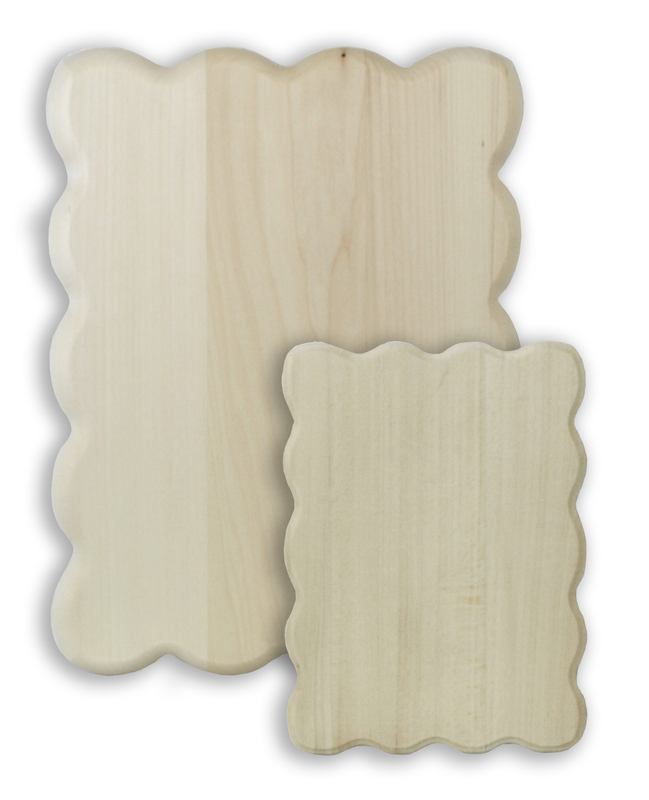 Silhouette Plaques: Walnut Hollow provided these 3 styles of Silhouette Plaques to CCU. 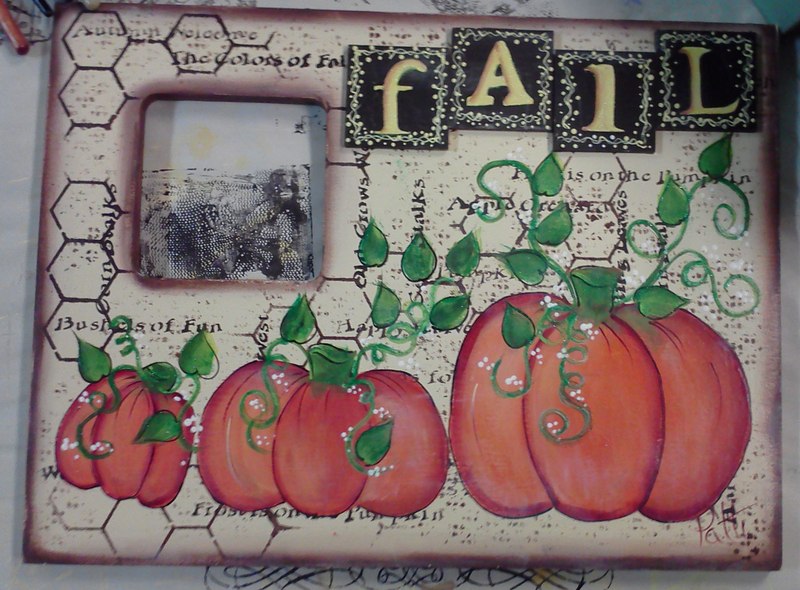 This board was done at the end of the day after working with all kinds of background ideas. 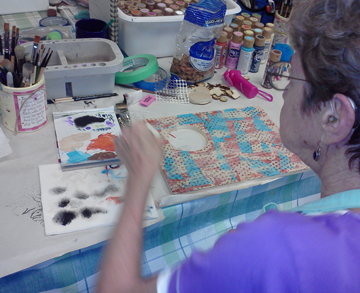 The students worked with multiple tools to create textures and design in their backgrounds. They received their Silhouette Plaque in a drawing and had the chance to choose their shape. 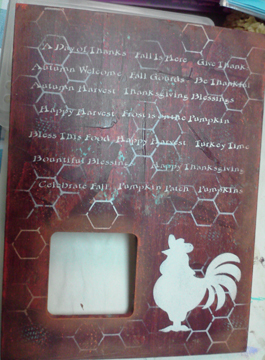 They used tools to create an interesting background and then stamped or stenciled to add elements on the Plaque. 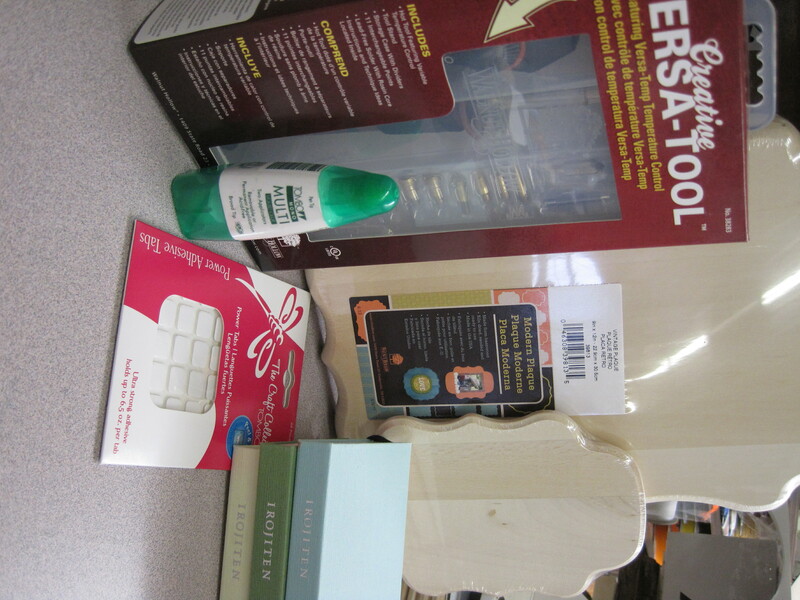 They had been given all kinds of household items and other products to create texture and design. Most were planning on using the opening as a photo holder. Some ventured out and tried other solutions for it. 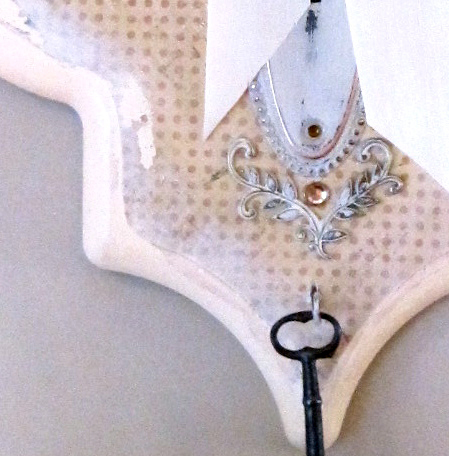 Other ideas included hanging a cutout in the opening and creating a design around the opening. You can see by the ideas that they really took the opportunity to try different seasons and styles. 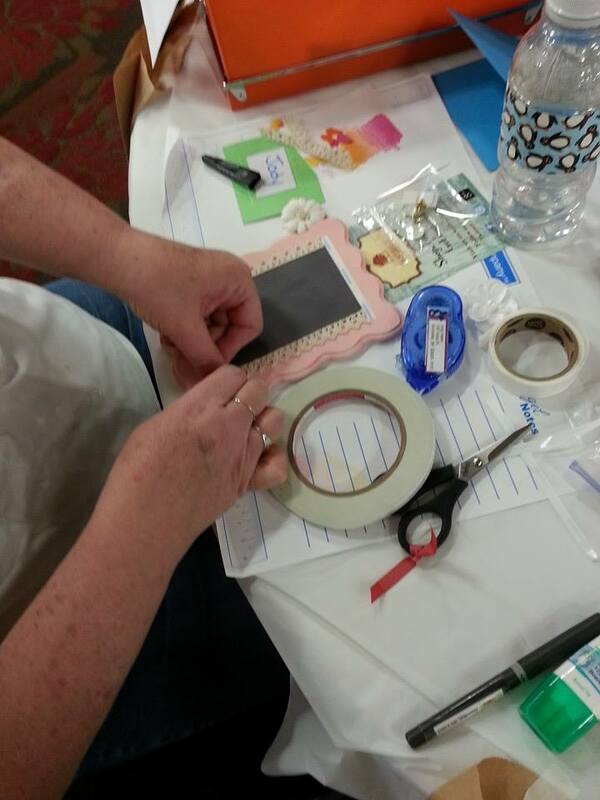 They also looked at a lot of journaling ideas being used by paper crafters and mixed media artists. 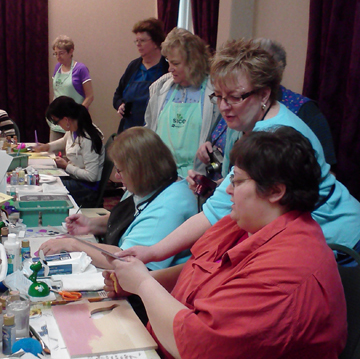 Participants were very pleased with both surfaces and enjoyed the opportunity to use them. Thanks so much to Laurie and her group of creative students for sharing so much with us. 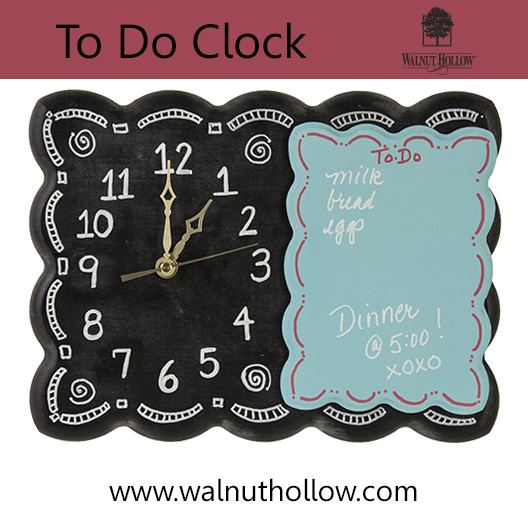 It’s our favorite thing to see what others do with Walnut Hollow products. 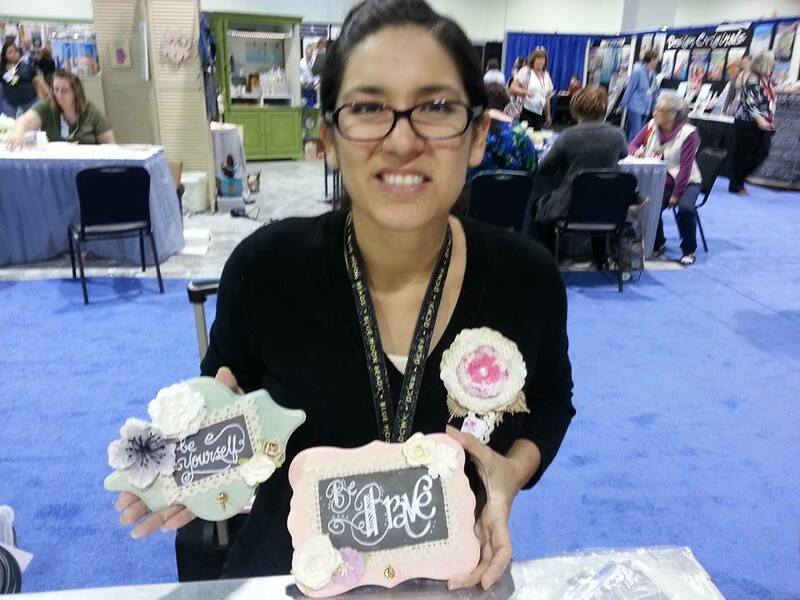 Well, today is the last day of our week filled with projects featuring Tombow® products. Since we use Tombow products all the time, it wasn’t by any means a stretch trying to design with their products. My goal was to show you how much you need them for general crafting use. Mission accomplished! 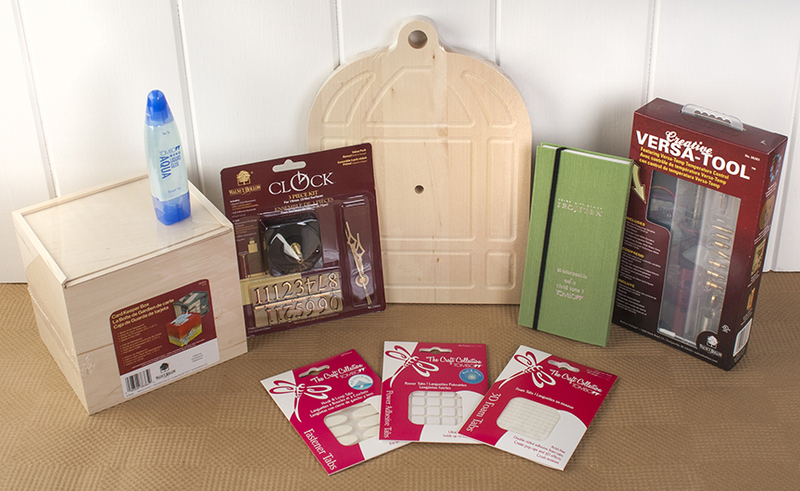 Today is also the last day of our week-long contest with the grand prize of products from Tombow and Walnut Hollow. Leave a comment here on our Blog. The more days you comment the more chances you have to win! Each day we will randomly chose a finalist and choose a winner from those finalists on the last day. The winner will be announced here at 1:00 pm (CST) Monday, May 6th. We’re sending a special thank you to Tombow for asking us to play and create with them! A couple weeks ago, I was at one of my very favorite stores – Archivers in Madison, Wisconsin. If you don’t have an Archivers nearby, you’re probably saving a lot of money! 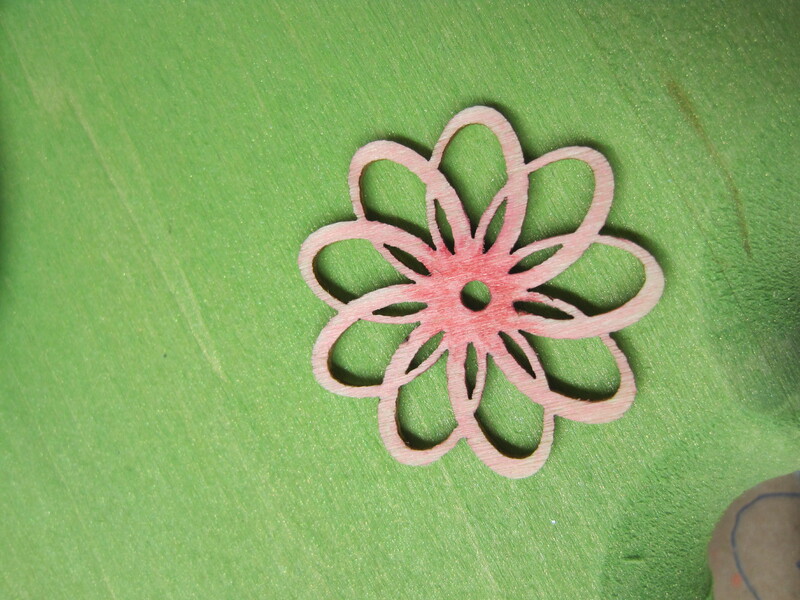 Anyway, I saw these really cute little wood laser cuts by Prima Marketing. Great mini shapes, right….. love the owl. 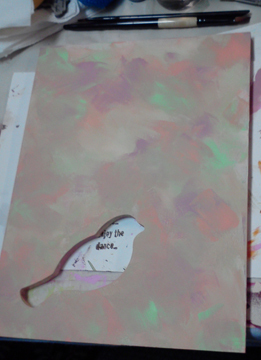 I thought I could use them on our new Modern Plaques for a fun project – they would be really nice for card making too. 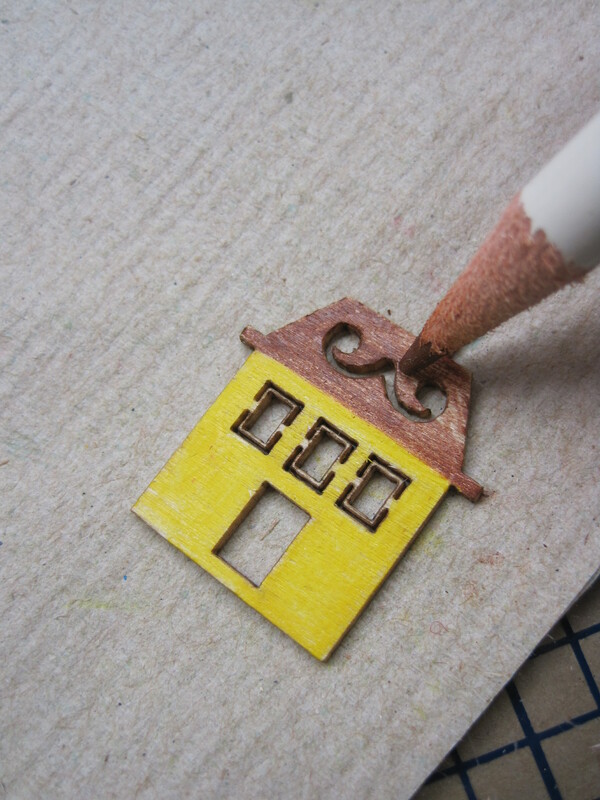 And a great use for the Irojiten Color Pencils to add color so easily to the small houses, flowers, birds and leaves. 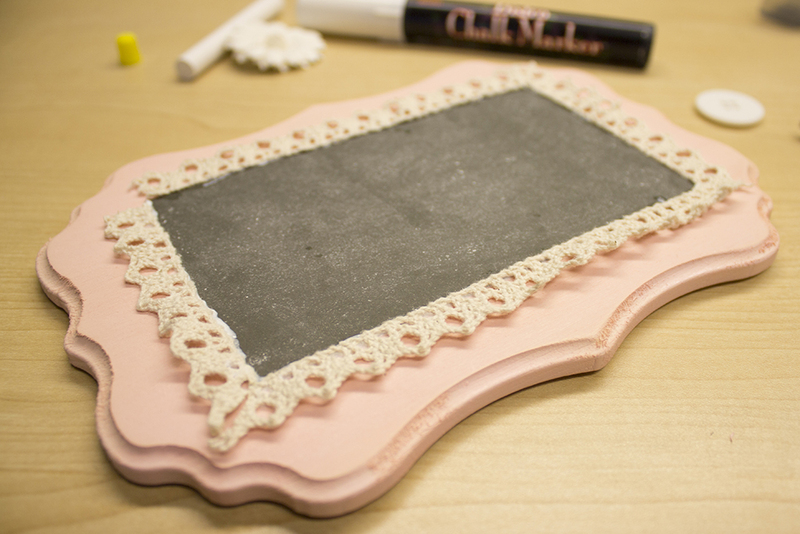 Using Tattered Angels Glimmer Mist, Chalkboard and Glimmer Glam seemed most appropriate and very easy to use on the Vintage Plaque and Monogram Thin Plaque. Thought that I needed a touch of the Glimmer Glam on the very edge of the smaller plaque to add a little sparkle to the Neighborhood. 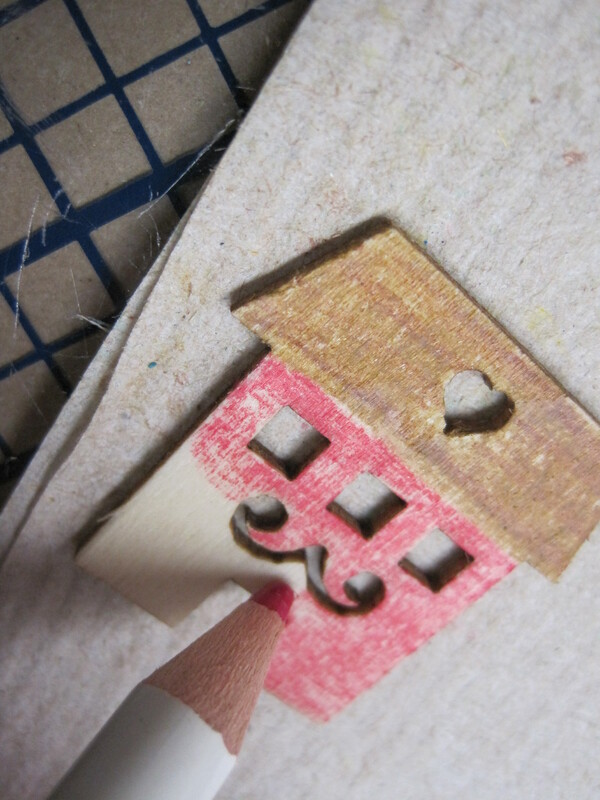 The really fun part was using the Pencils on all of the little wood pieces. You can pick the colors you want. Sometimes I just filled in a space with a color, sometimes I shaded – up to you. 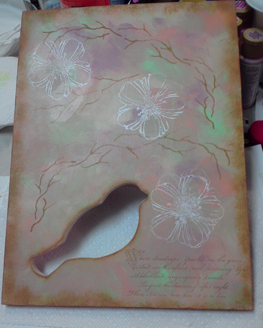 There was a little hole in the flower I used, so I decided to add more sparkle with an adhesive back crystal. I added MONO Multi Liquid Glue to the back of the flower and placed one in each of the four corners of the Vintage Plaque. Use tweezers to place the adhesive back crystal over the hole. Following the instructions inside the packaging found with the Creative Versa-Tool®, turn the Versa-Temp control to the Yellow-Orange Zone. Use pliers to attach the Flow Point securely on the Tool. Holding the Tool perpendicular to the crystal, touch the tip of the Point on the crystal and let the heat from the tool penetrate the crystal to melt the adhesive. 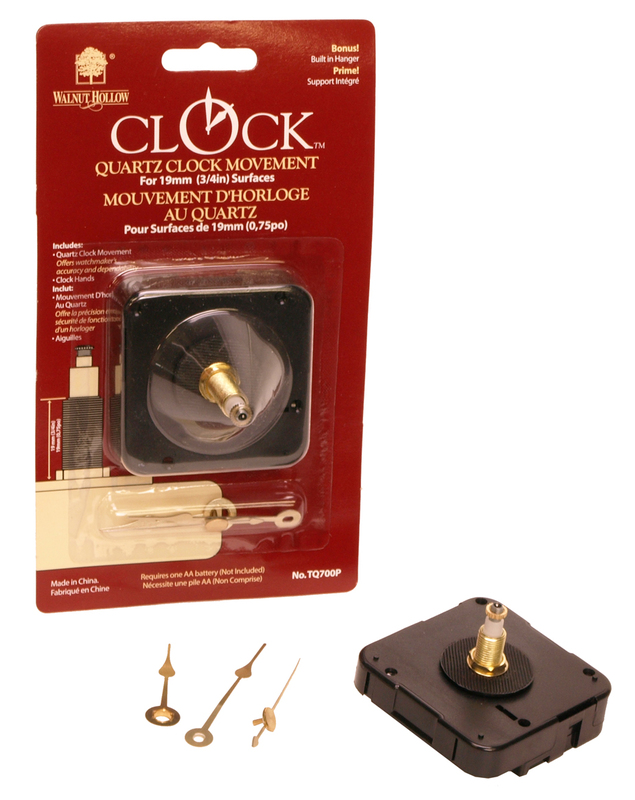 You’ll feel the adhesive melt and the crystal slightly move. Lift the Tool off the crystal and move to the next flower. 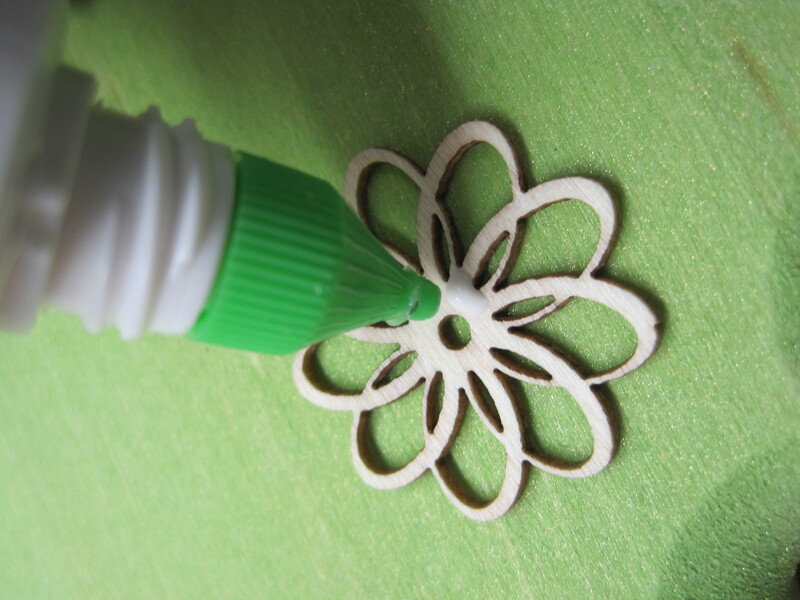 When the adhesive cools, the crystal will be permanently adhered to the flower. 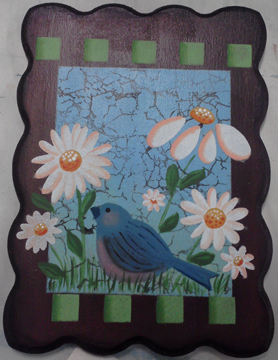 I used the MONO Multi Liquid Glue to adhere the houses, leaves and birds to the small plaque. I wanted a little more dimension, but not too much like a Foam Tab, so I attached the little owls to the larger plaque with the Power Tabs. The Power Tabs are terrific and very strong. 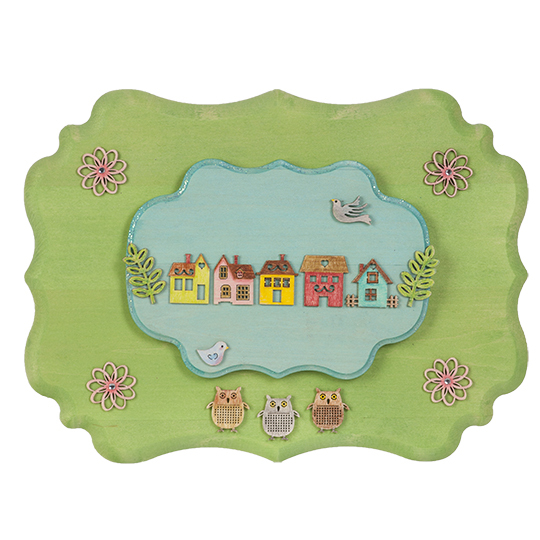 Thought this would be cute in a young child’s room – you could make your own Neighborhood! 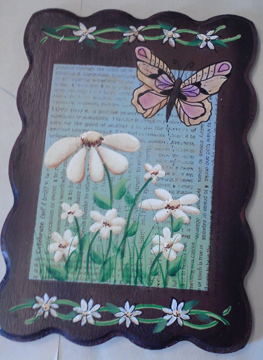 A new Designer emerging into the Craft Industry, Tatiana has created artwork on Walnut Hollow’s new Vintage Plaque. 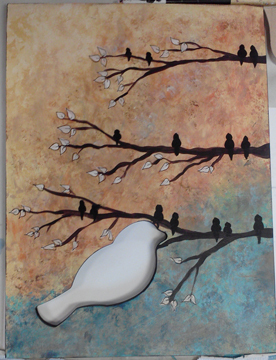 Tatiana wants to uplift and encourage others, creating art based on the words that can accomplish this. Her “Sky’s the limit” does just that! You will find a link to a step-by-step tutorial on how to make clay banners using our Clay Embossing Set below the instructions. Wipe plaque down with a lightly moistened paper towel. 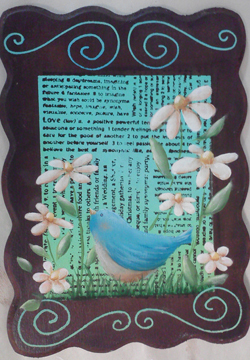 Create a sky background on the Plaque by dry brushing Cloudless and White. 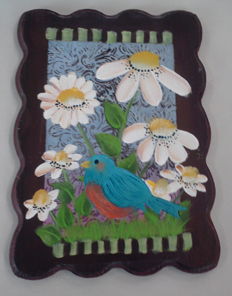 Paint the border, edges and a little of top of the background with Cayman Blue. 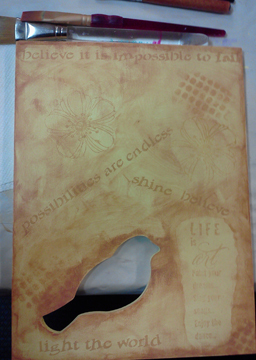 While paint is drying, knead Gold Yellow clay in hands until it is warm and pliable. Take the clay and press into the mold until it has taken on the form of the balloon. 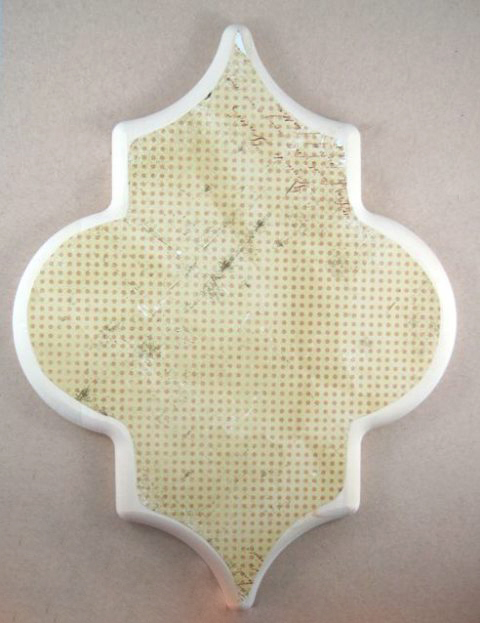 Remove any excess clay protruding from the mold with the Clay Blade. 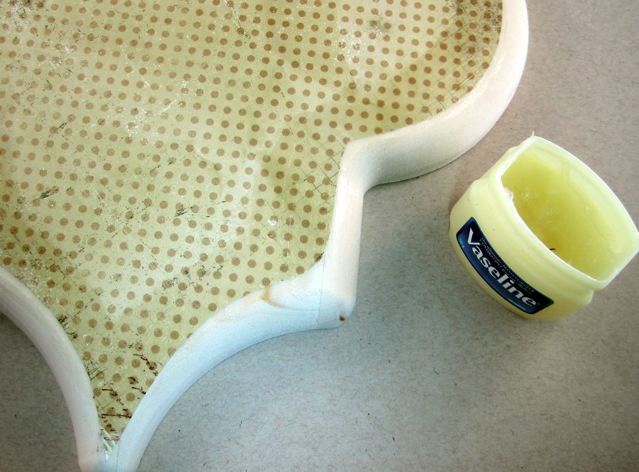 Gently remove clay from mold with fingers tips and place on a craft mat. Create lines in your balloon by pressing Blade into clay in a rocking motion. Paint every other stripe with Papaya paint. Open up Heart Brad and press into center of the balloon, set aside. Using Sahara clay, knead it until it is pliable. Roll clay with rolling pin to 2mm thickness or through pasta machine on setting #3. 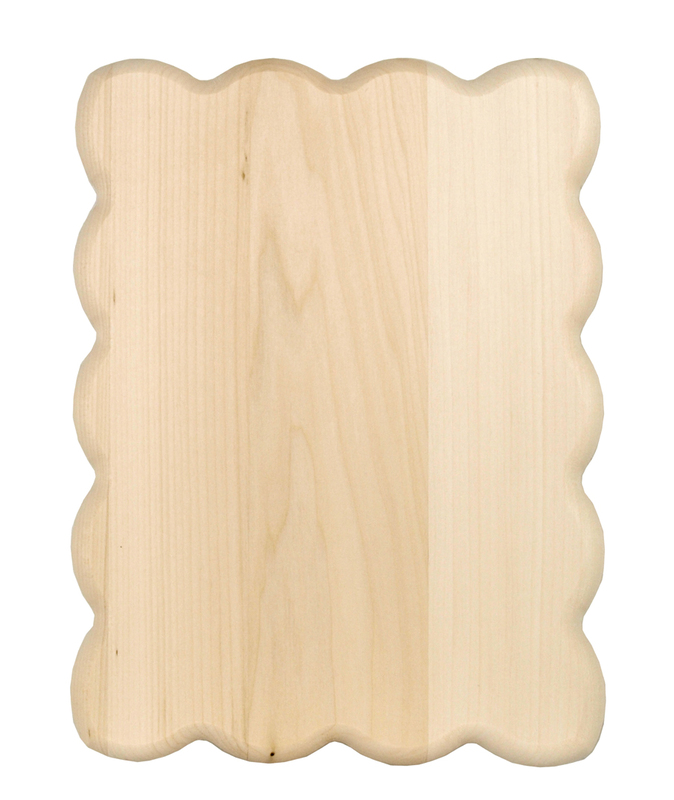 Place the rolled out strip of clay onto a baking sheet. Press cookie cutter into clay and cut out 15 individual triangles from it. 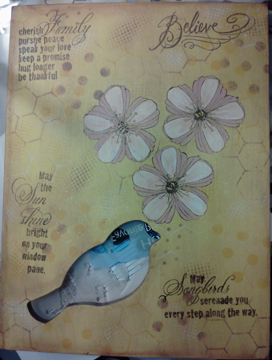 Use Embossing Set to stamp the letters “SPREAD YOUR WINGS” into triangles. Poke holes into the top right and top left corner of each triangle. Heat all your clay pieces in a craft oven at 230* F for 30 minutes and remove. Once all your pieces have cooled, paint the letters with Lamp Black paint. Cut 3, 12” pieces of wire and use them to string banner letters together. Add 3 screws to both sides of the Plaque and wind wire ends around them. Apply Gel Medium to backside of Balloon and Wing Charms and affix to Plaque. 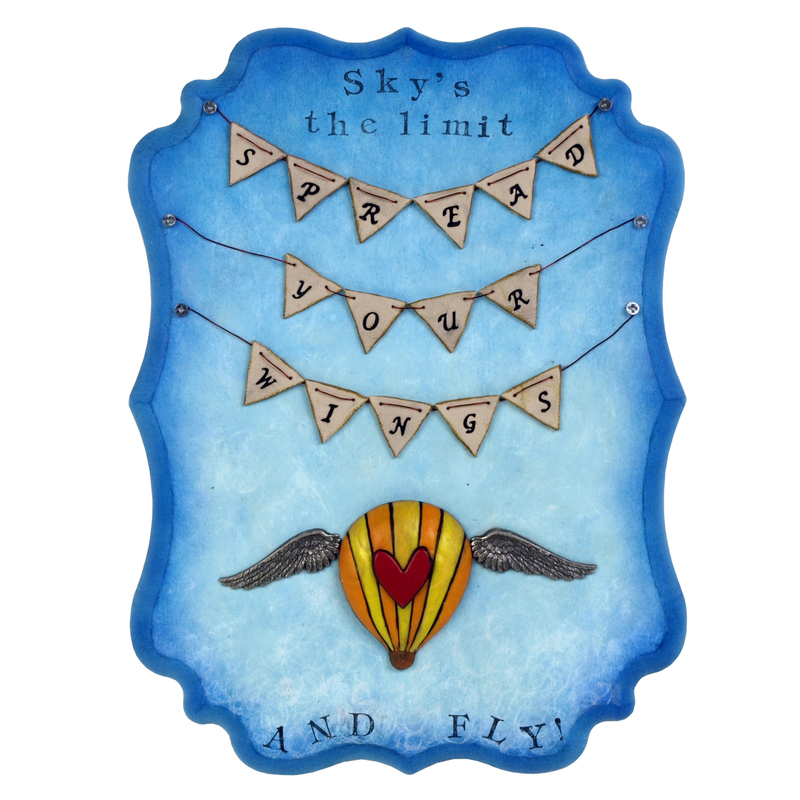 Ink your letters with StazOn and stamp “Sky’s the limit, AND FLY” to Plaque. 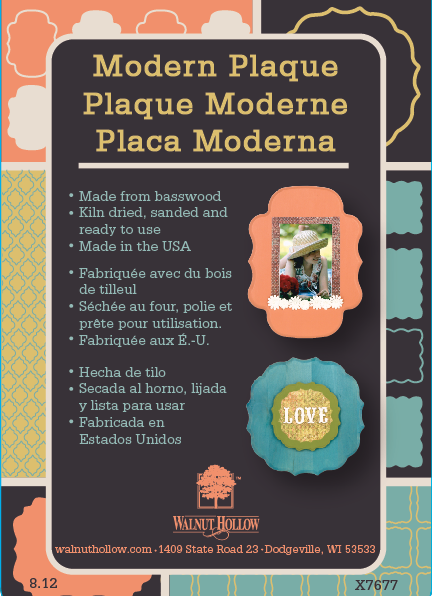 It was fun to help with the product development of the new Modern Plaques. They are modern, but with a vintage touch that makes them very on-trend. There are 6 shapes available in 2 sizes of each. The Plaques are approx. 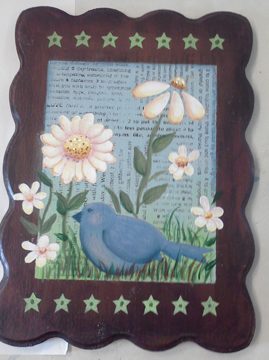 9 x 12” and the smaller Thin Plaques are approx. 5 x 7”. What has been even better is to create designs using both sizes and finding that stacking them is terrific! As I said before, I like to have everything ready when I begin putting a project together. 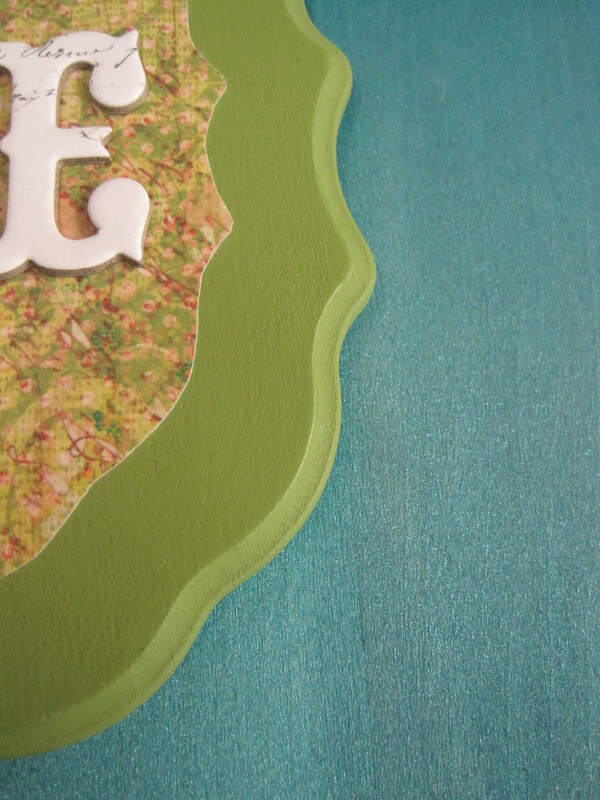 I wanted to cut paper to go onto the Medallion Thin Plaque and was having trouble getting the shape just right. Lucky me……I have access to our graphic designer, Sara, who could resize the shape for me. 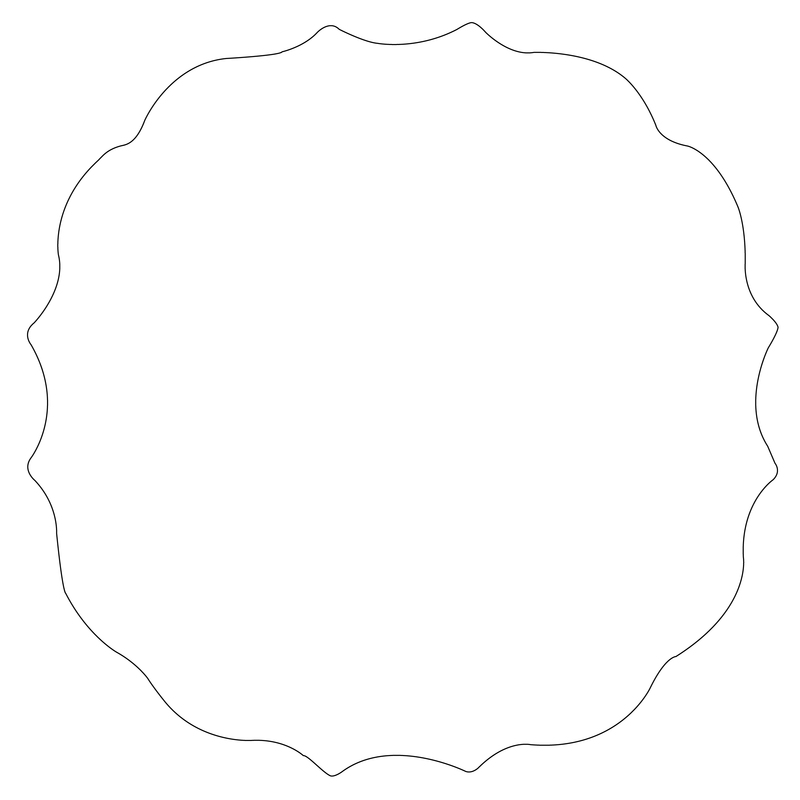 Now you have the shape ready to print or trace onto your paper…and we’re all lucky! Just cut the paper out and you’ll be ready to go. The Tattered Angels Glimmer Mists are great to use. We found them a couple of years ago and haven’t stopped using them. 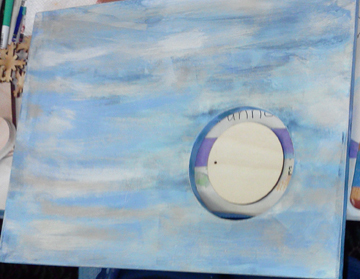 In the past, I would seal any wood project before painting on it. 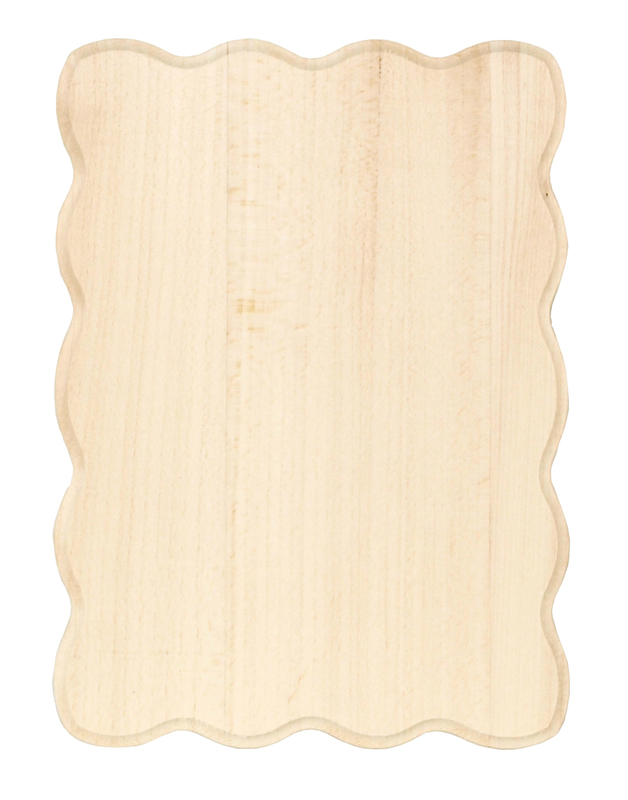 Glimmer Mists can be sprayed, or misted, directly onto the raw wood with no wood sealer necessary. 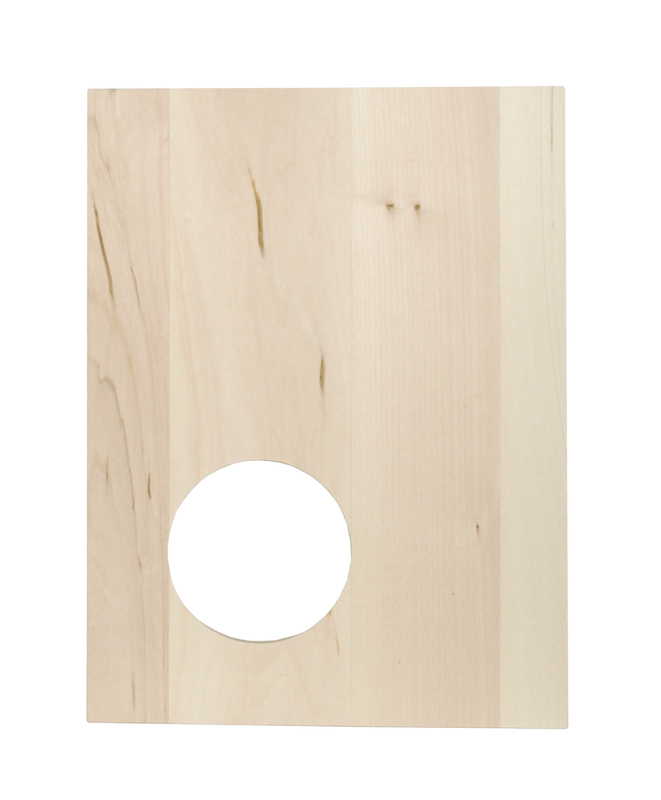 In fact, they work best when the wood isn’t sealed – that sure saves a lot of time and they are so easy to use. Just shake the bottle from side-to-side to get the glimmery, shimmery stuff all mixed up in the bottle. Make sure you cover your work surface so that the mist doesn’t get anywhere you don’t want it. Spray the entire Medallion Plaque with Mallard Glimmer Mist. 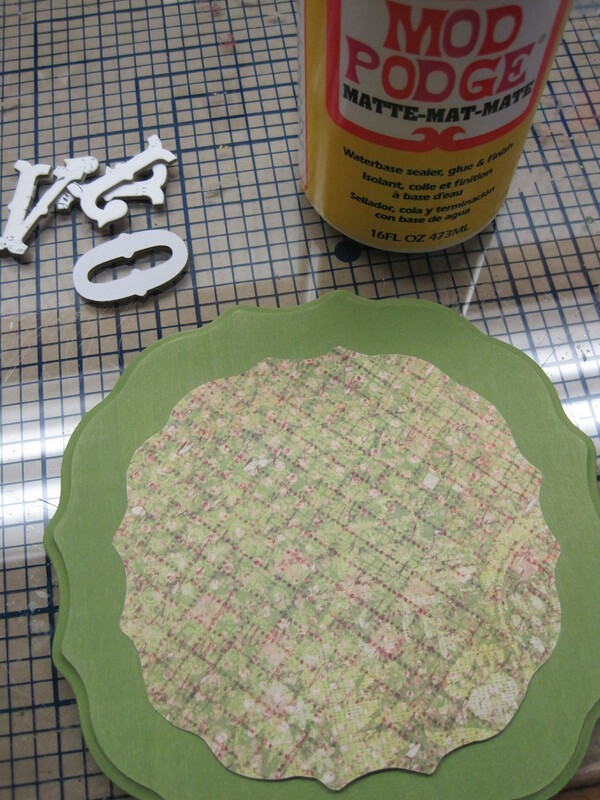 Use a large flat brush to paint the Medallion Thin Plaque with DecoArt® Americana® Hauser Medium Green. 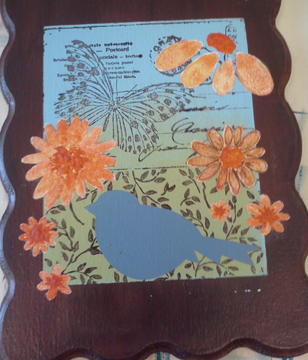 Once it is dry, you’re ready to decoupage the cut paper onto the Thin Plaque with Mod Podge®, Matte. 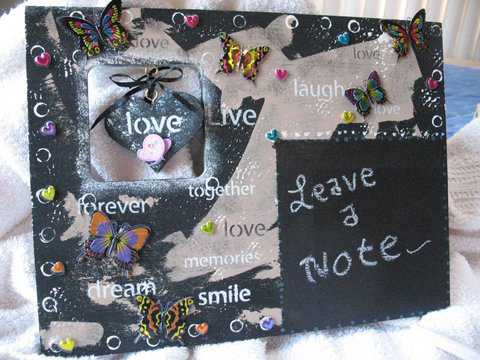 Apply a coat of Mod Podge to the back of the paper, flip it over and press it into place on the Plaque with your fingers, smoothing the paper out. 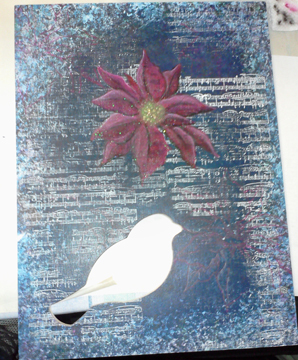 You don’t need to wait for it to dry to apply another coat of Mod Podge to the top of the paper. 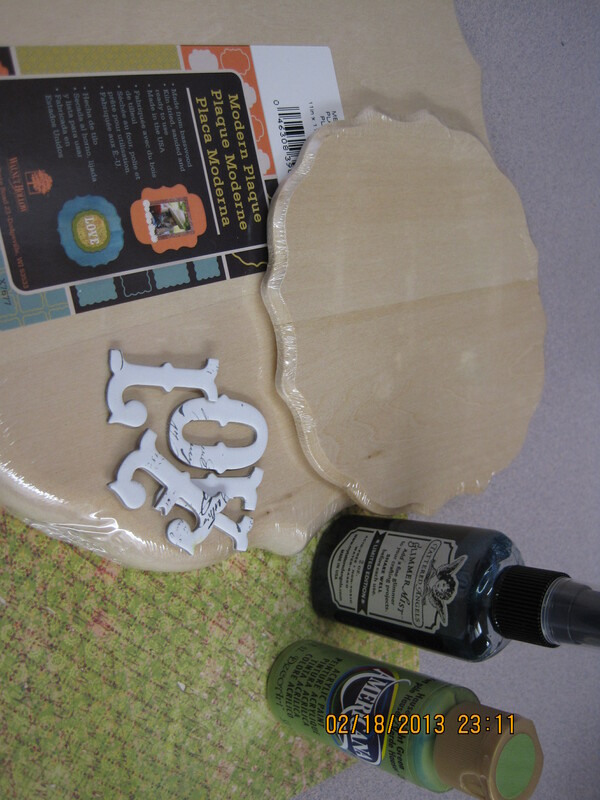 After that dries, apply one more coat over the entire top of the Thin Plaque. 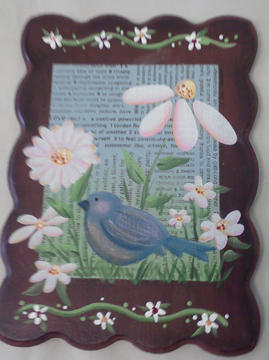 Even though I used a matte version of the Mod Podge, it is a little shiny and looks great next to the Glimmer Mists on the large Plaque. 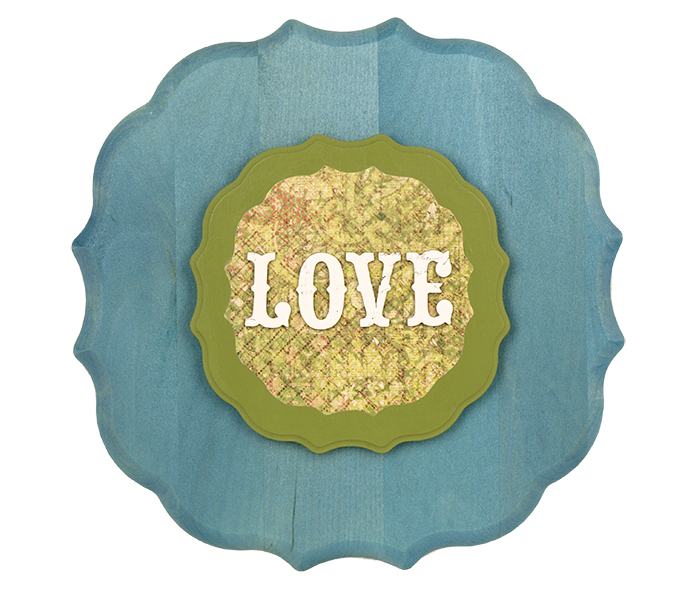 Apply a heavy coat of Mod Podge to the back of the Thin Plaque to adhere it to the top of the large Medallion Plaque. 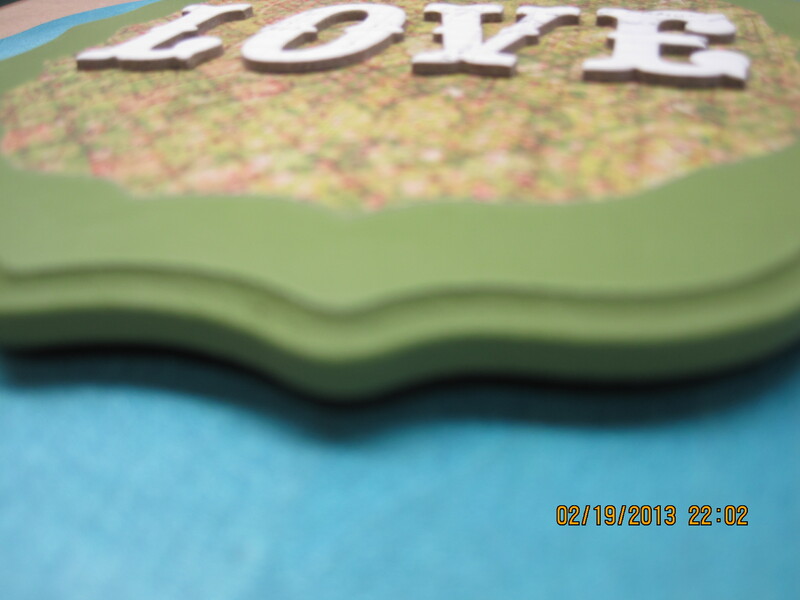 The Mod Podge works as a glue. Press the Thin Plaque in place and press again to secure it. Let it dry thoroughly. The chipboard letters I used have a sticky back. 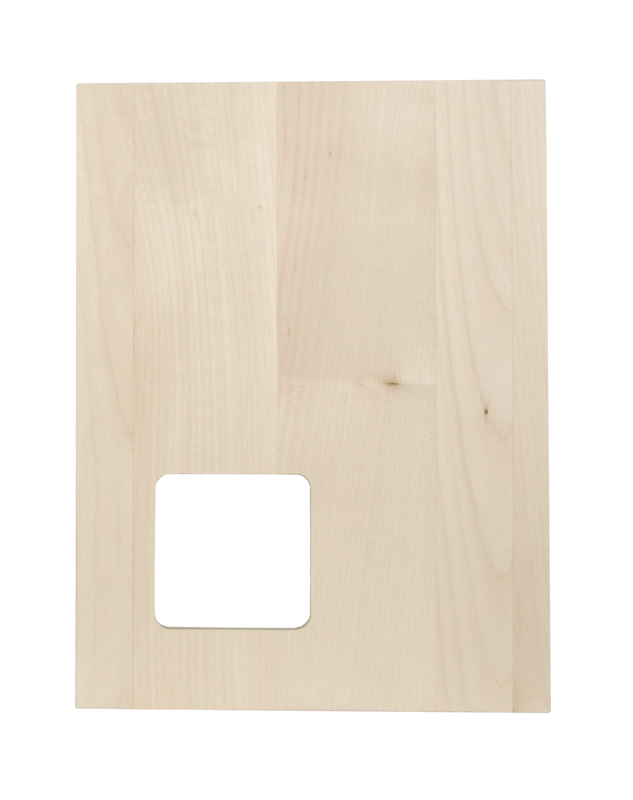 Peel the back off and press onto the Thin Plaque. I thought you might like to see the other Modern Plaque that we placed on the label. It’s a Monogram Plaque. It was so simple to create. 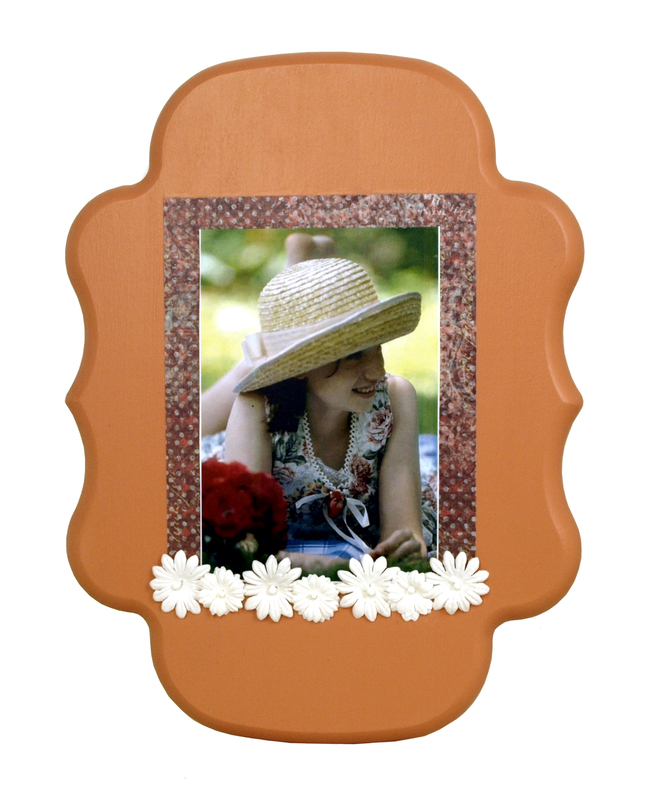 Just basecoat with paint, mount a favorite photo onto decorative paper and add paper flowers under the photo. Marie is a friend and wonderful artist and designer. 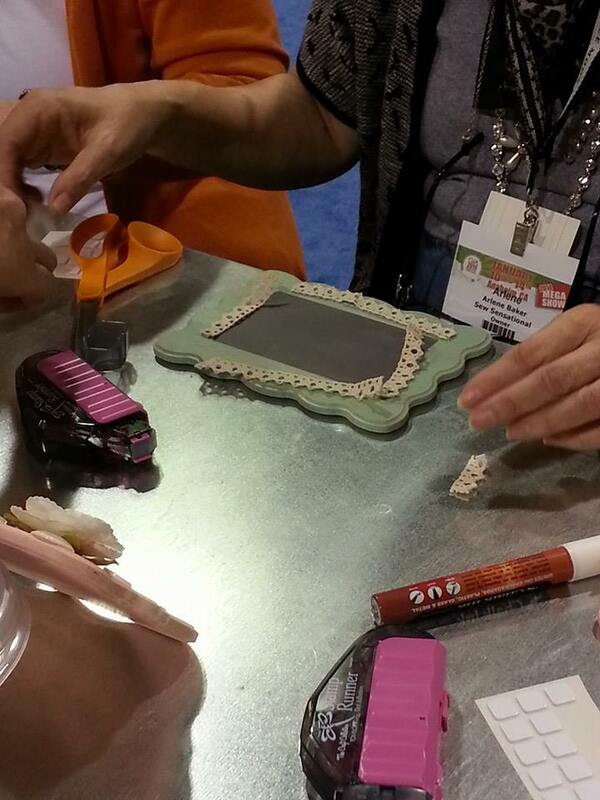 I asked her to do her magic on one of our new Modern Plaques and she chose the Marrakesh Plaque. 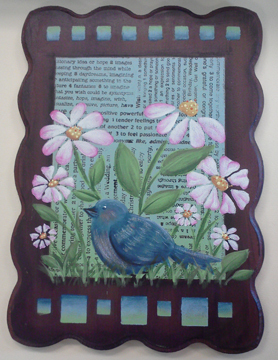 I think you will agree with all of us here at Walnut Hollow that Marie’s design work is simply beautiful. 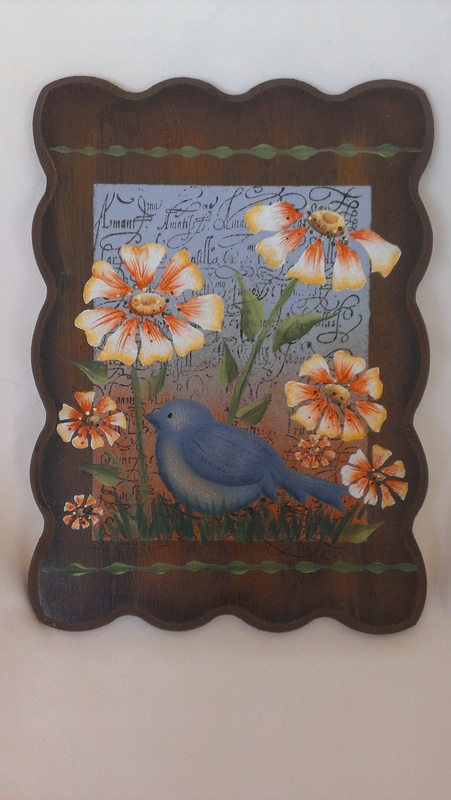 This fancy plaque is not only beautiful; it’s practical as well. 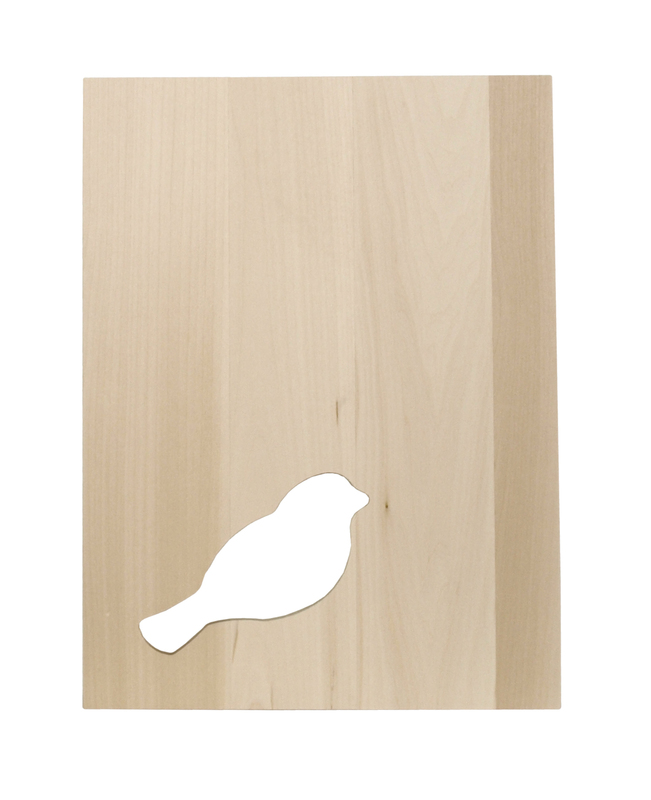 Perfect to place your purse, scarf or keys on when you come through your door. Created in neural colors to go with a wide variety of decor hues. Cabinet knobs – sample used one brass know and two crystal knobs. 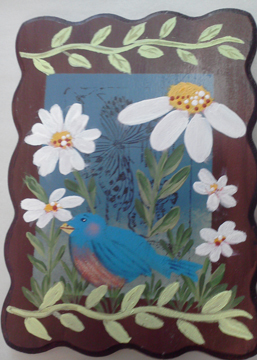 Paint the plaque with the Ivory acrylic paint. Let dry. 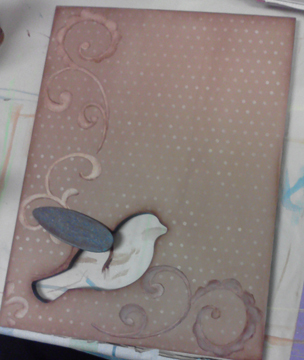 Cut and attach the cardstock to the plaque using the decoupage medium. Leave a 3/4” to 1” edge all around. 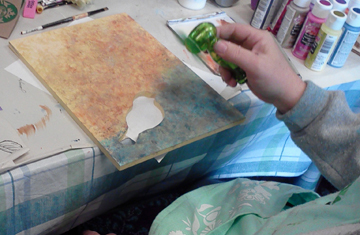 Apply a top coating of the decoupage medium and let dry. 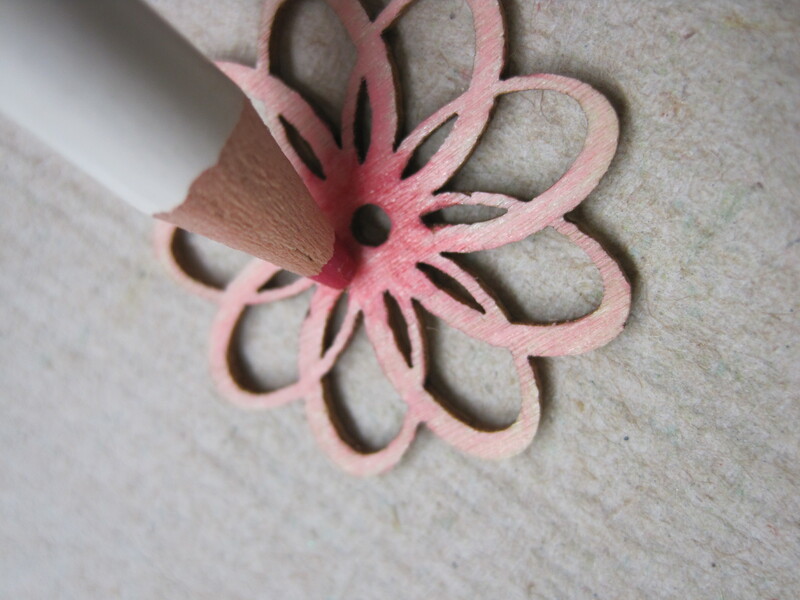 Apply the petroleum jelly to the painted edge and 3/4” into the paper. Paint over the petroleum jelly and let dry. The petroleum jelly acts like a resist, and when dry and sanded, gives you a nice weathered distressed surface to the edge of the paper and the painted wood. Rub any excess petroleum jelly off with a soft cloth. 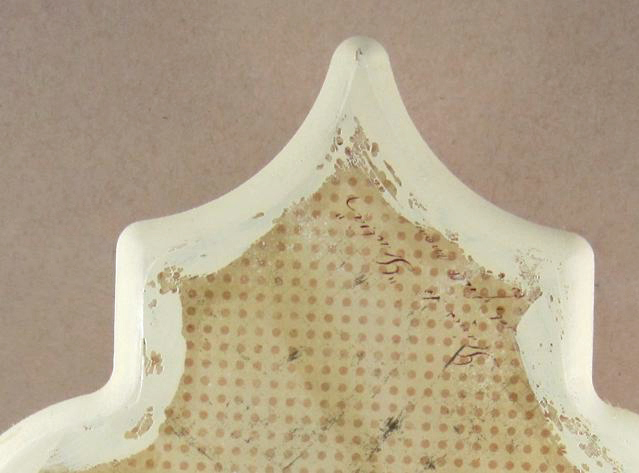 To soften the effect, drybrush the acrylic ivory paint around the edge. 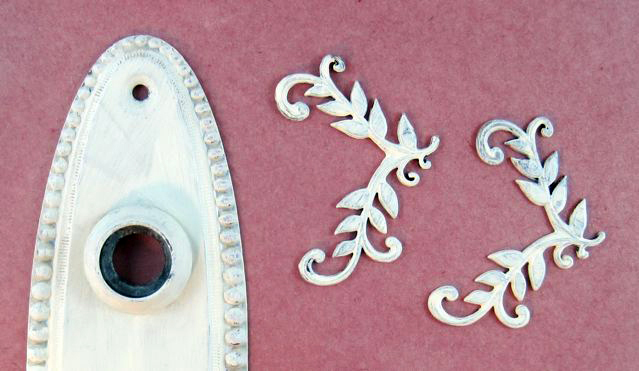 Paint all the metal pieces; the backplate, metal embellishments, hooks and screws with the Ivory acrylic paint. 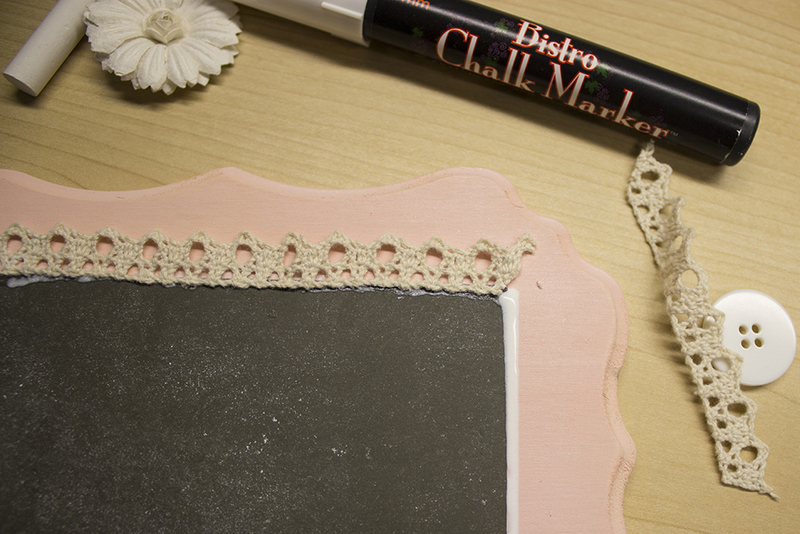 When dry, rub with the steel wool to create the distressed vintage look. Attach all the hardware to the plaque. 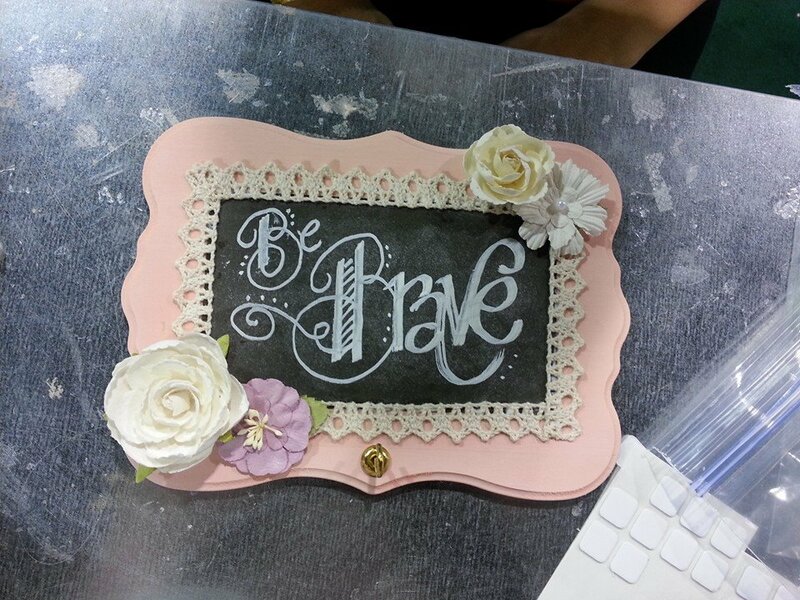 Using the white glue, attach the rhinestones and the rhinestone flourishes to the plaque. 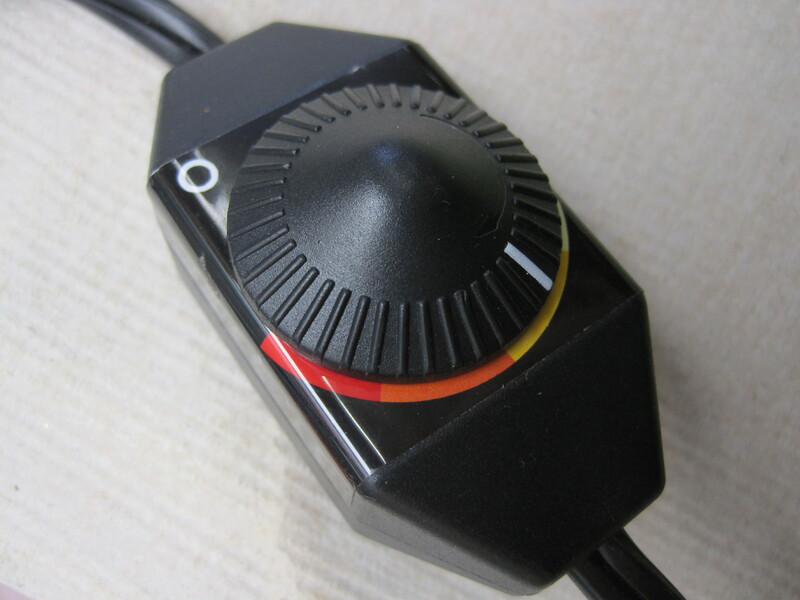 Finish with a silk bow tied around the center knob.